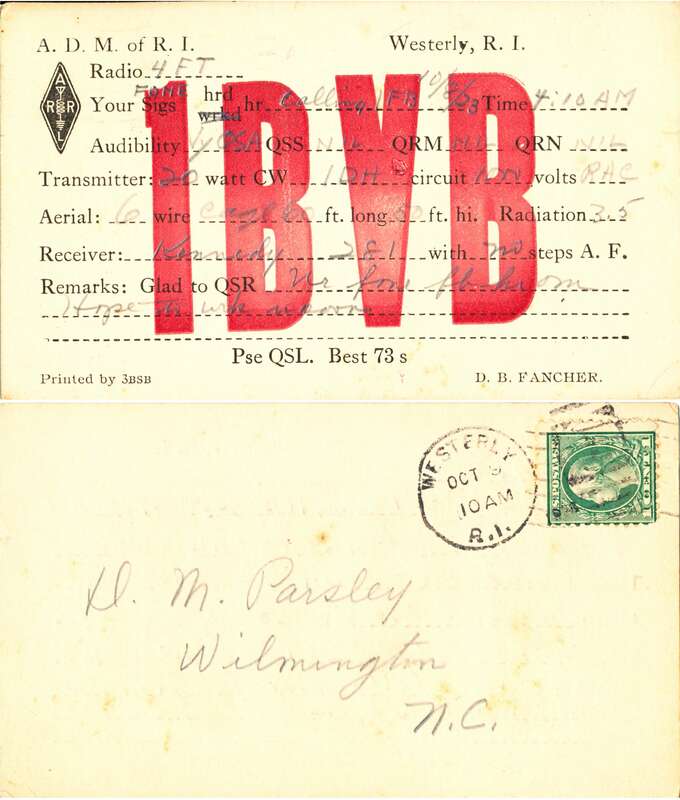 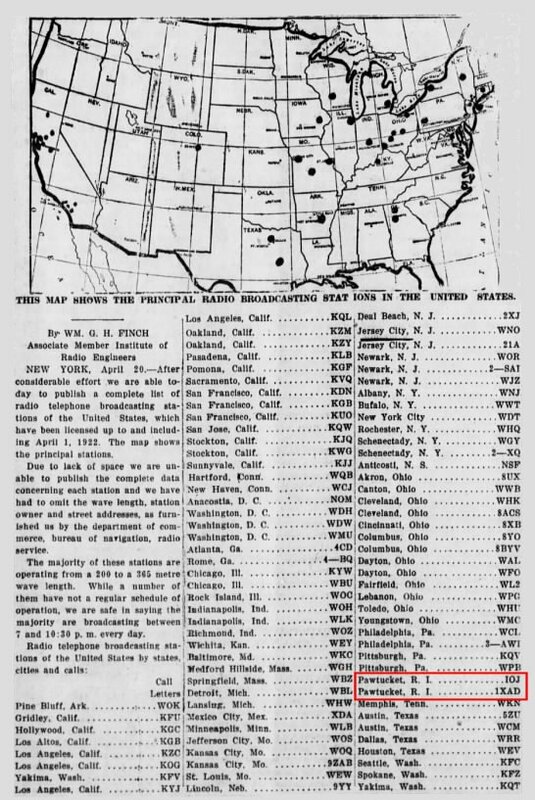 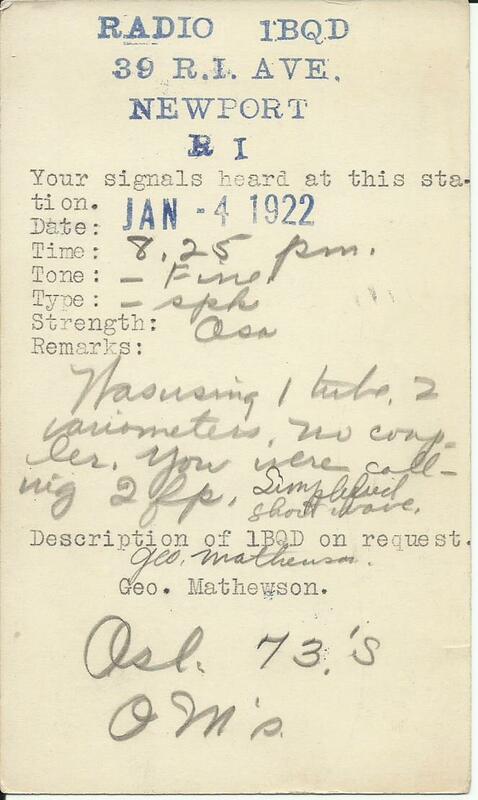 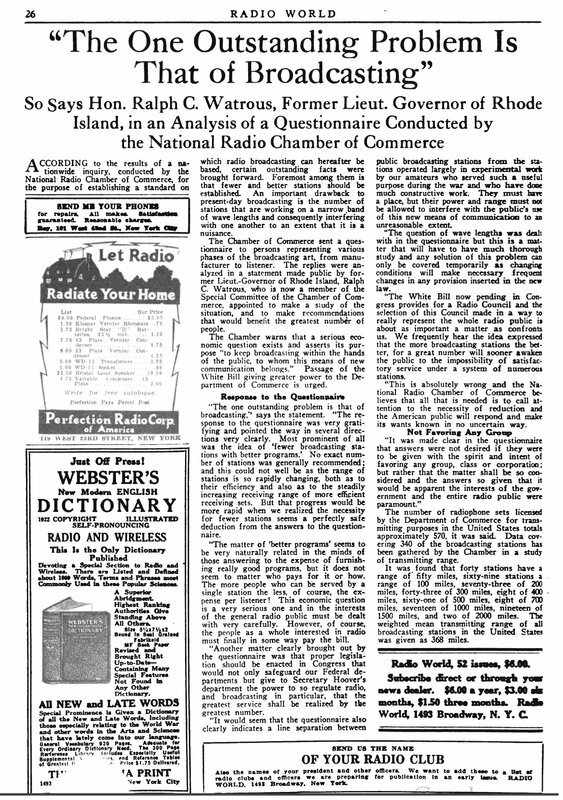 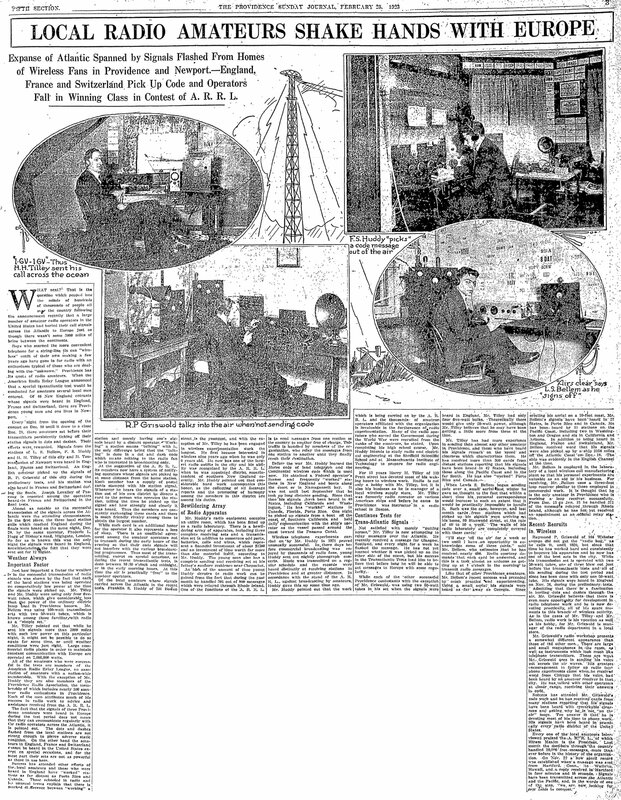 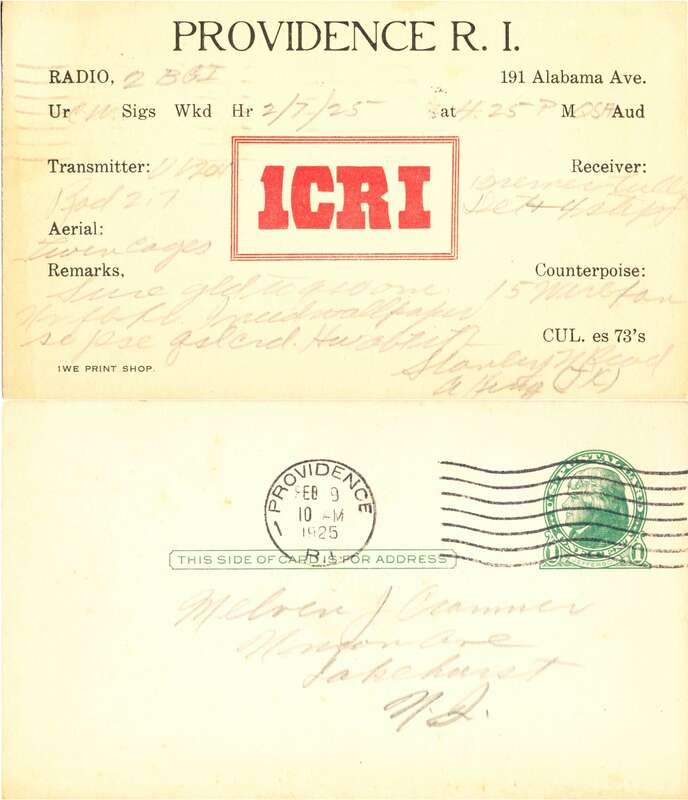 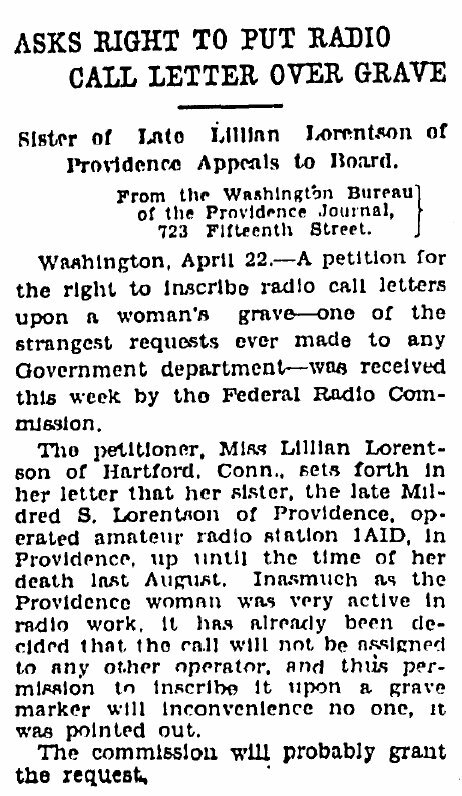 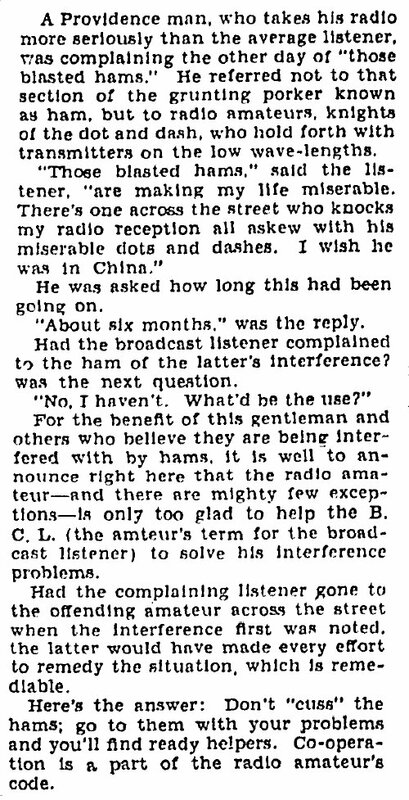 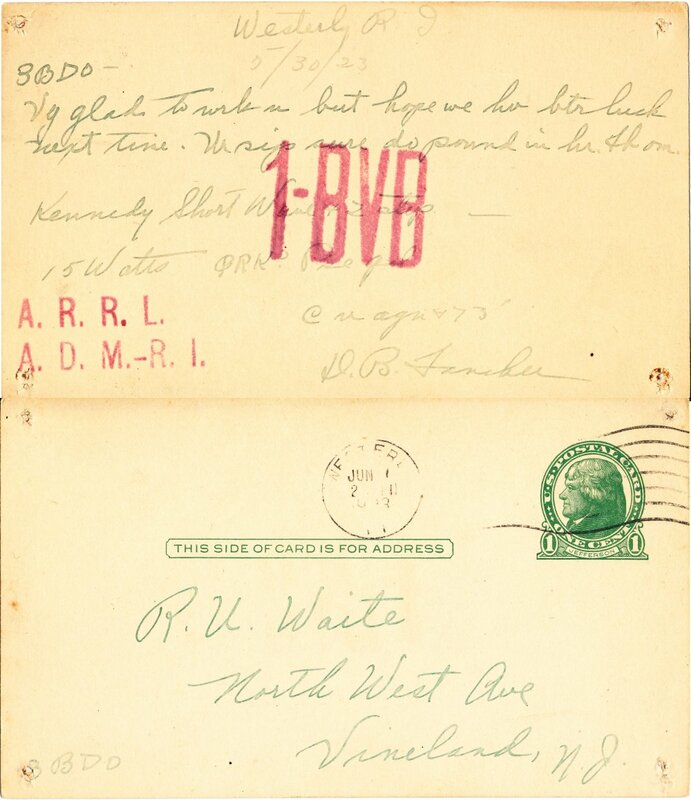 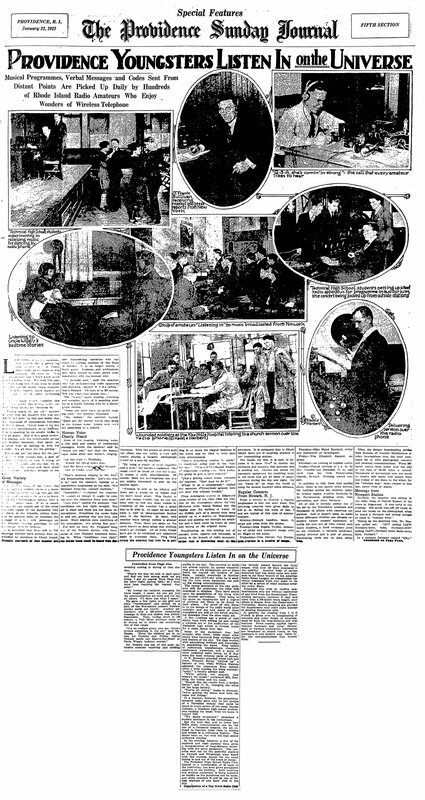 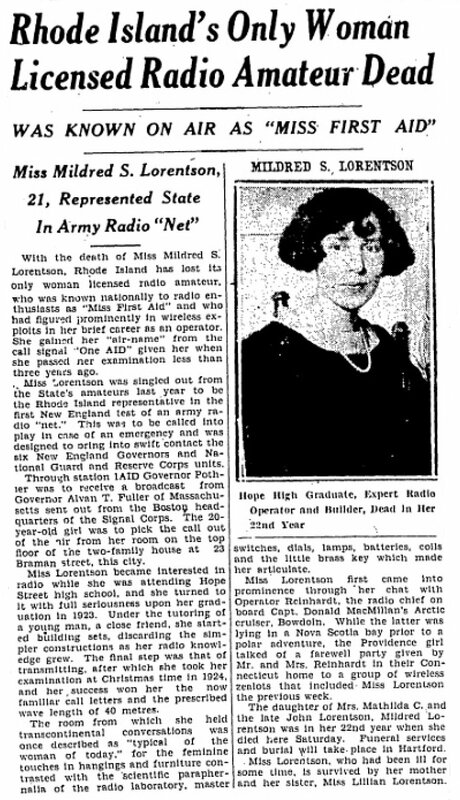 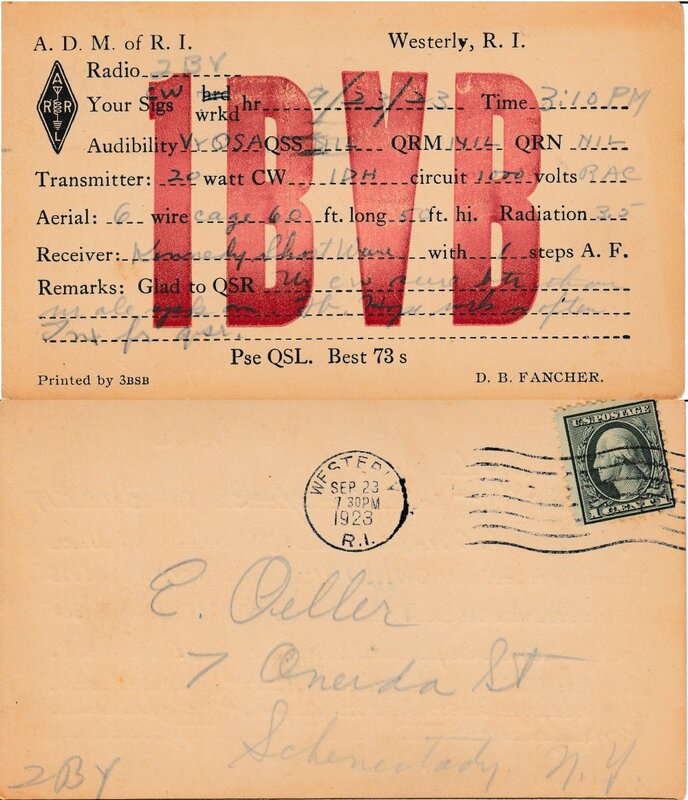 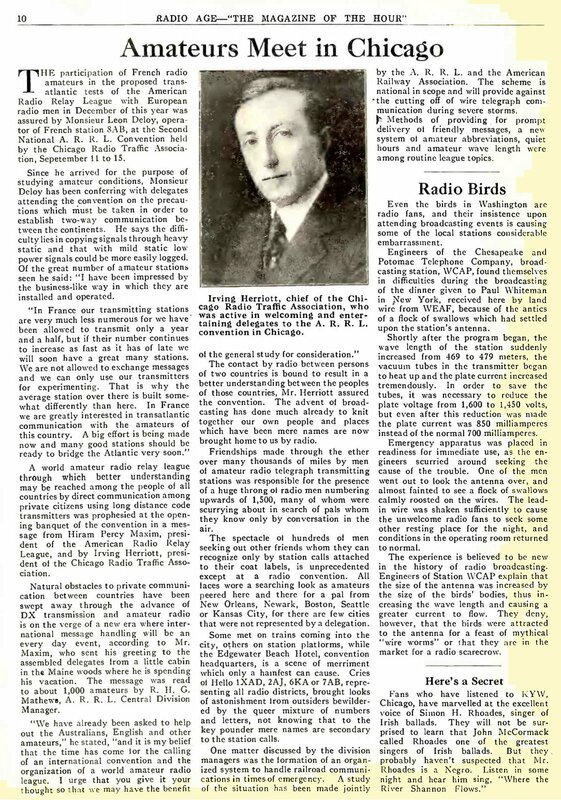 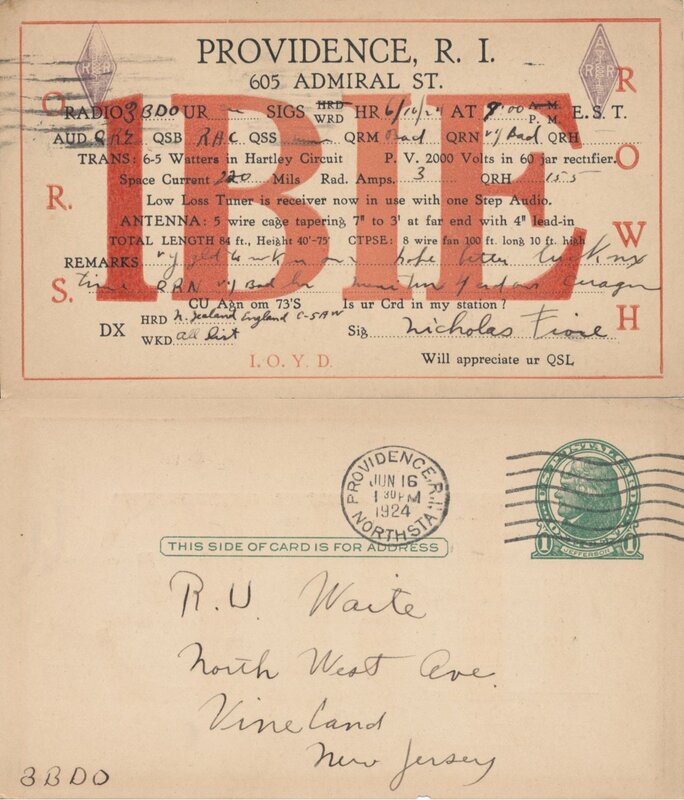 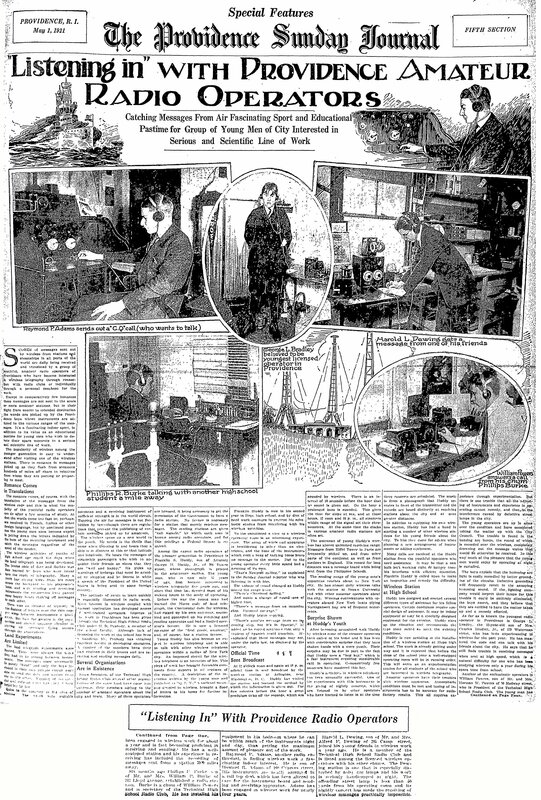 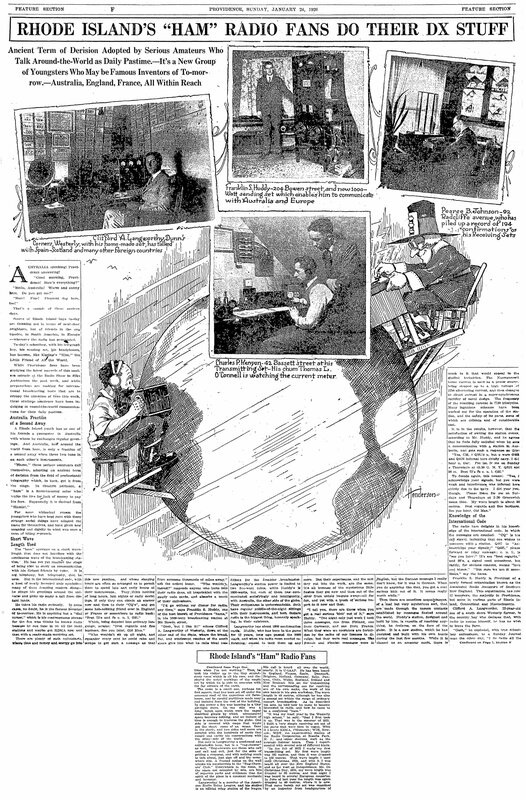 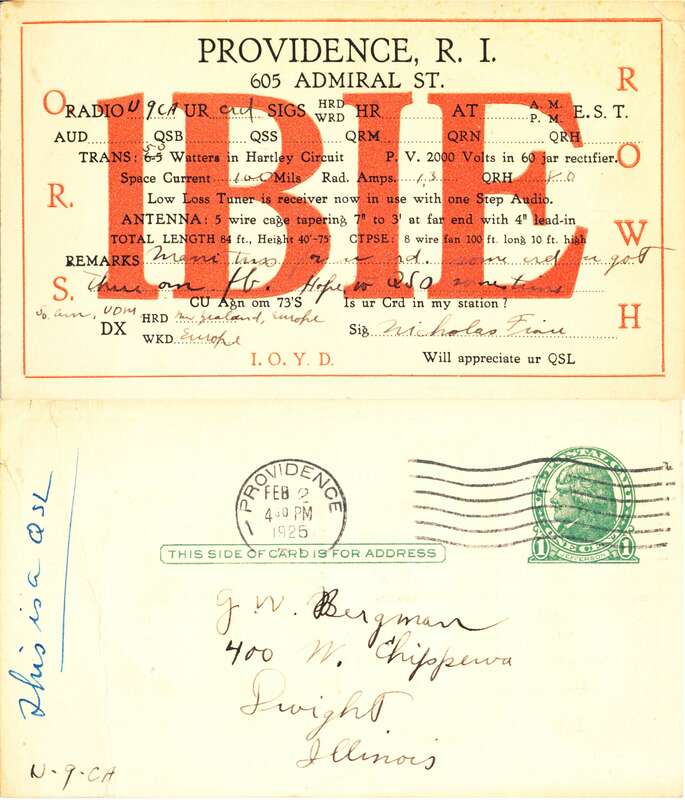 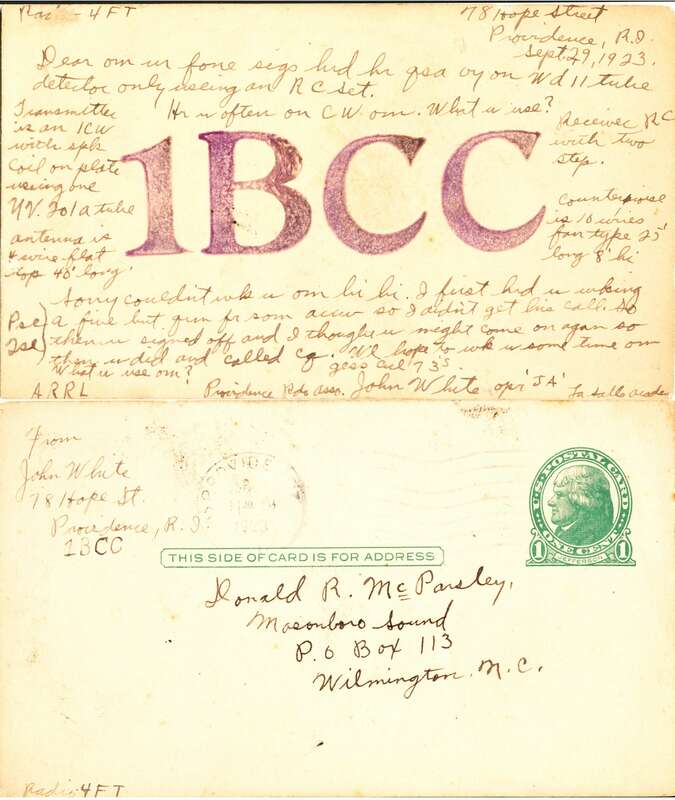 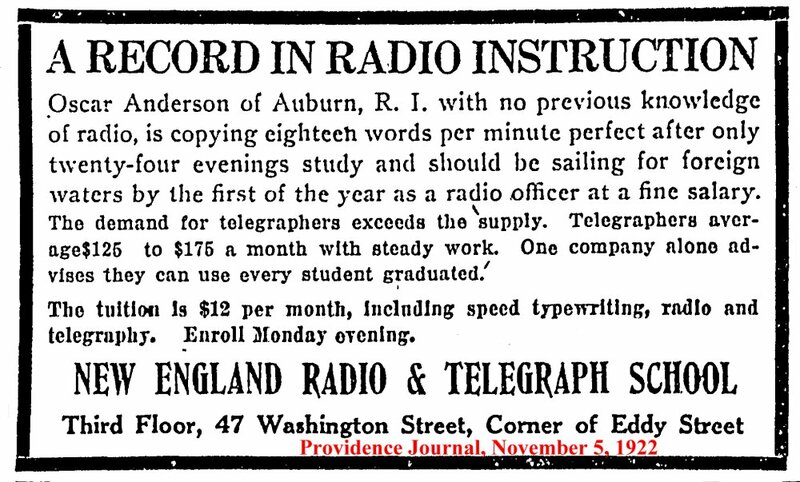 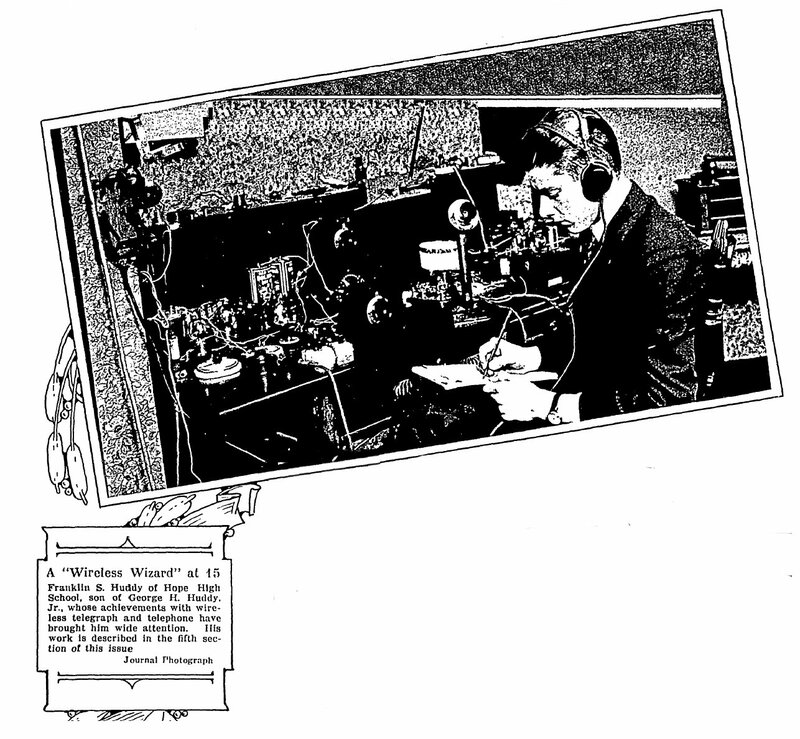 By late 1921 enthusiasm for broadcasting had started to develop nationwide, and the Bureau of Navigation decided to formally designate standards and wavelengths for a specific broadcast service. 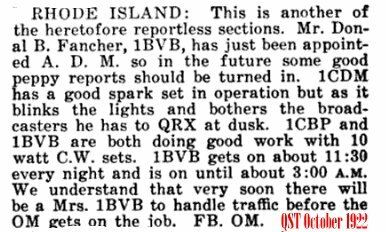 Moreover, in addition to entertainment broadcasts, it saw the need to provide for broadcasts of official government reports. 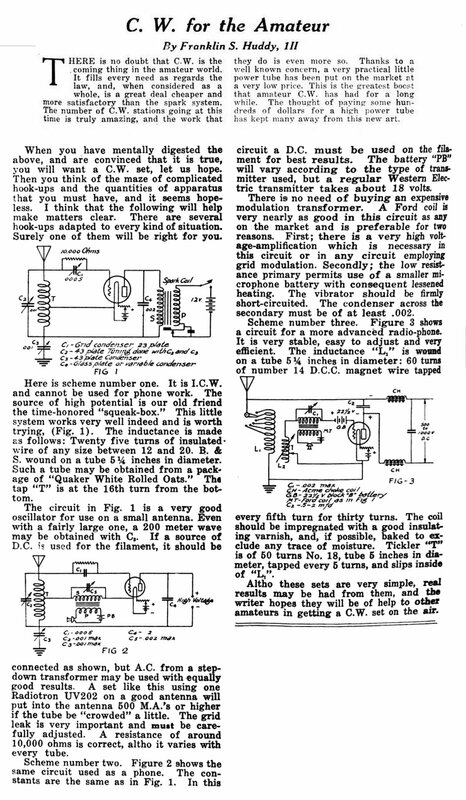 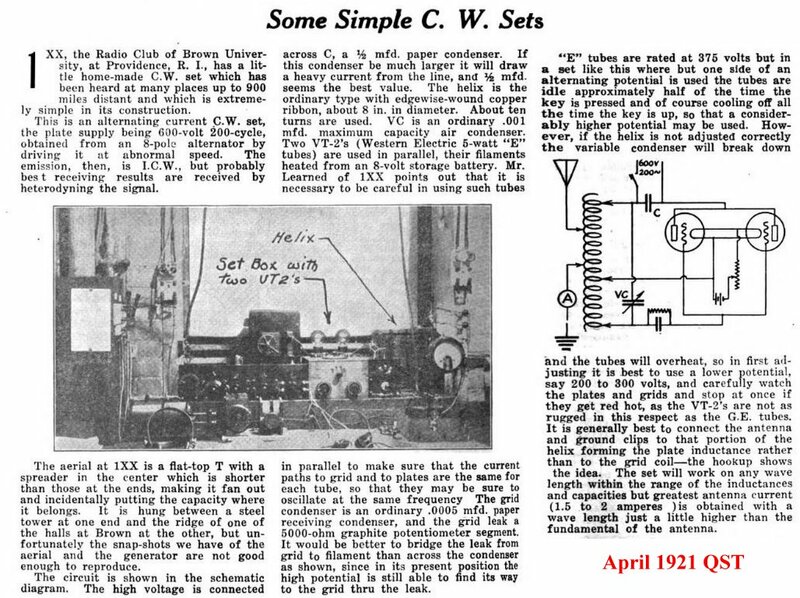 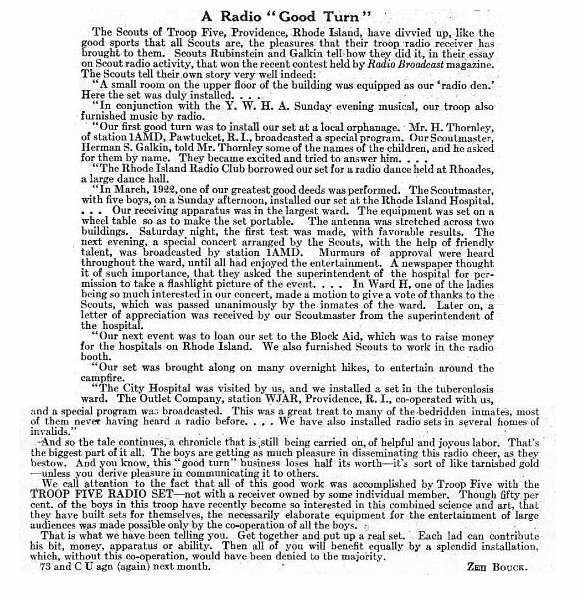 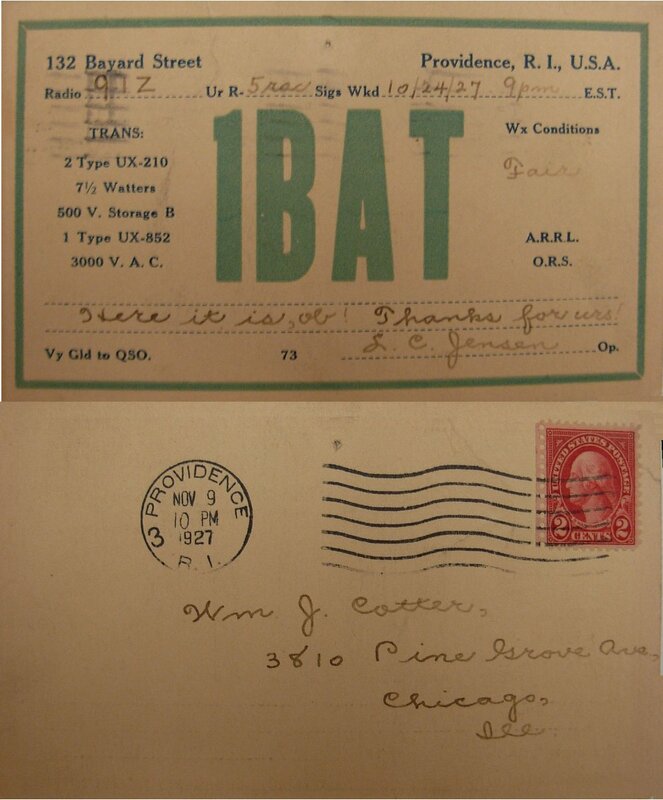 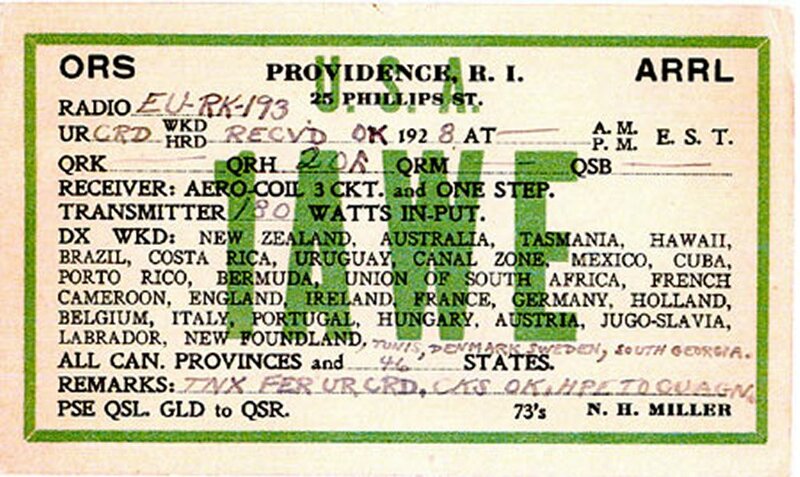 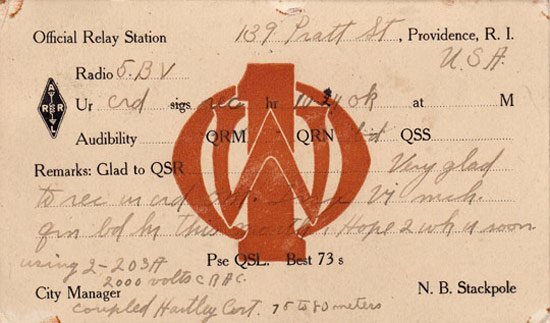 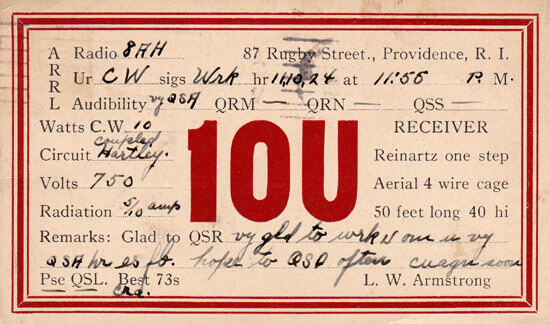 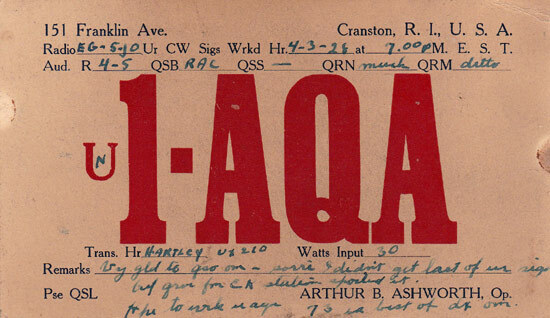 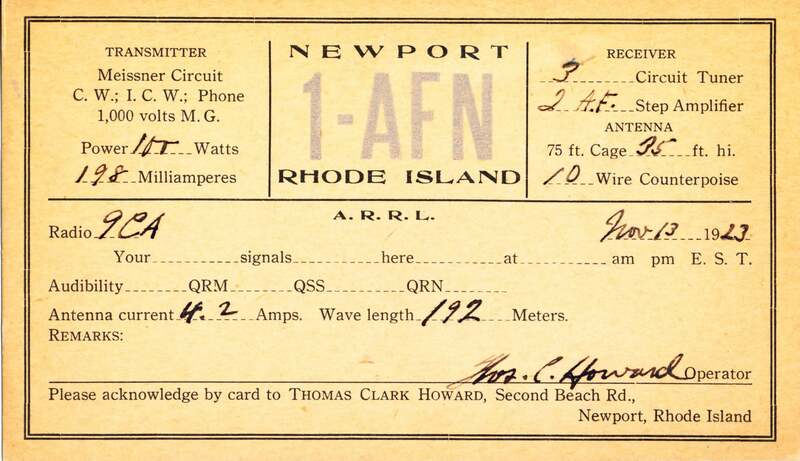 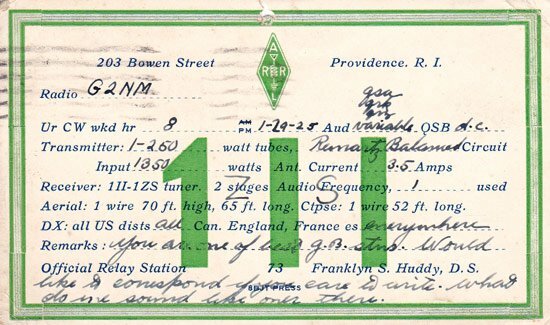 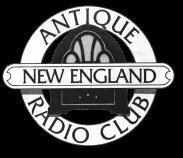 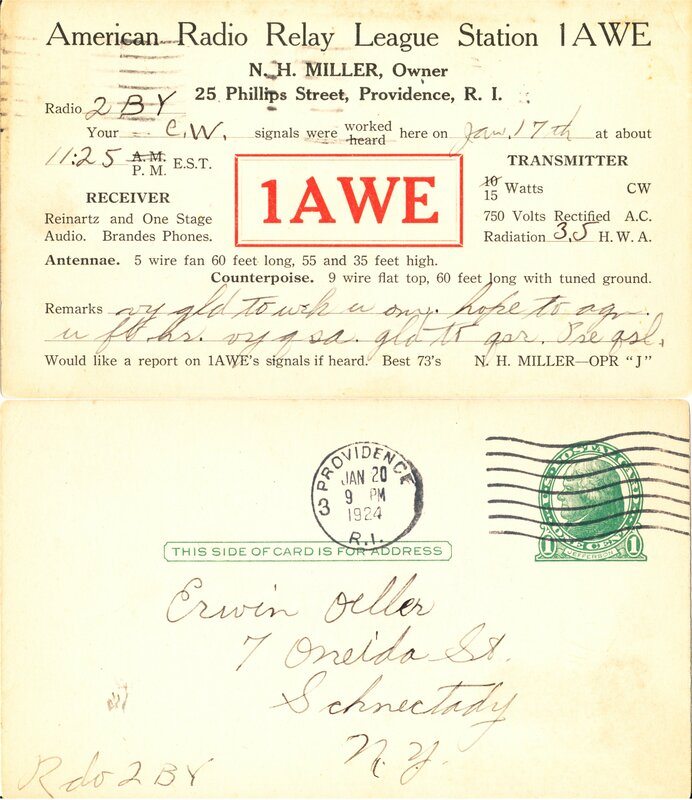 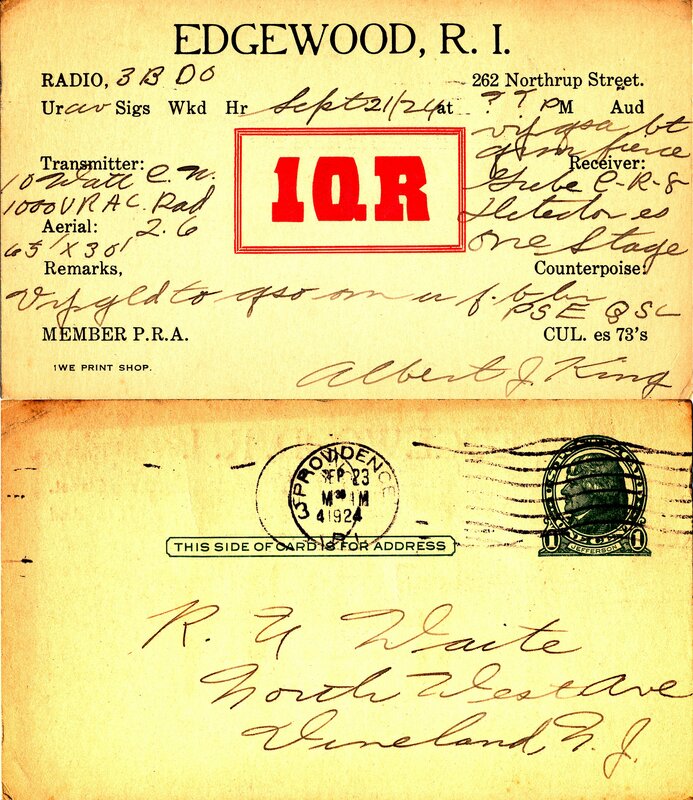 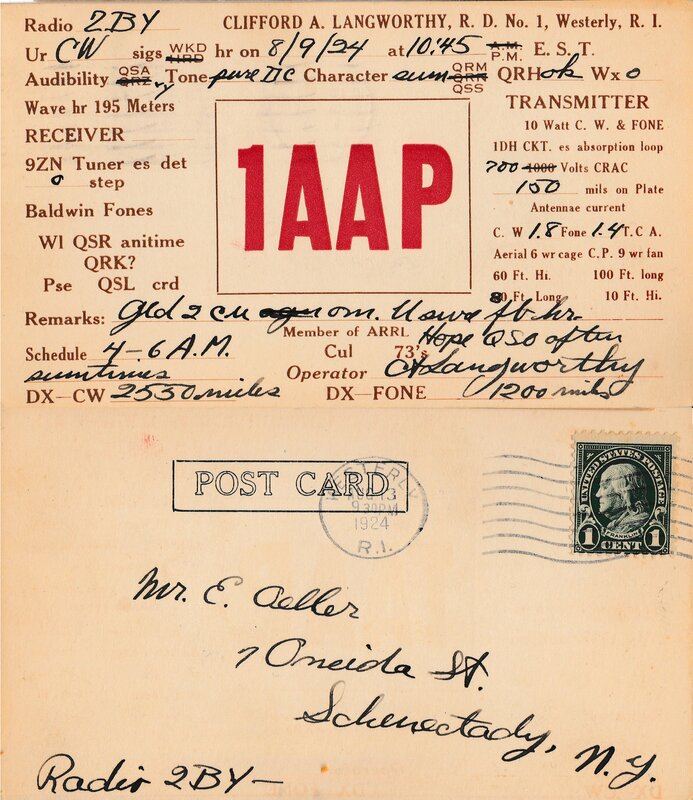 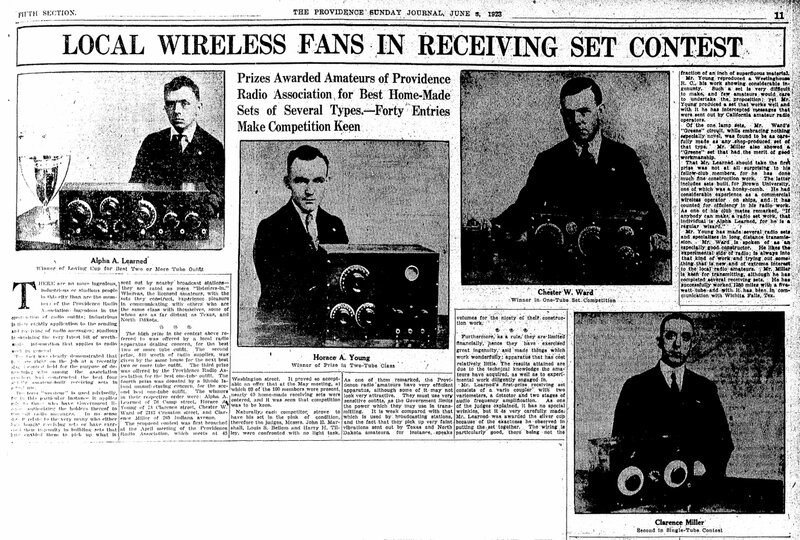 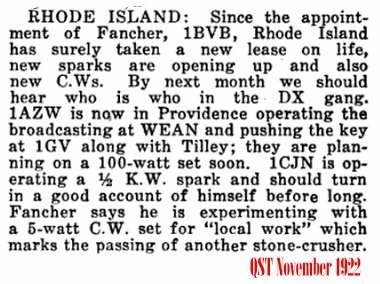 On December 1, 1921 two wavelengths were formally set aside for broadcasting, set up as a service category within the already existing "Limited Commercial" class of stations. 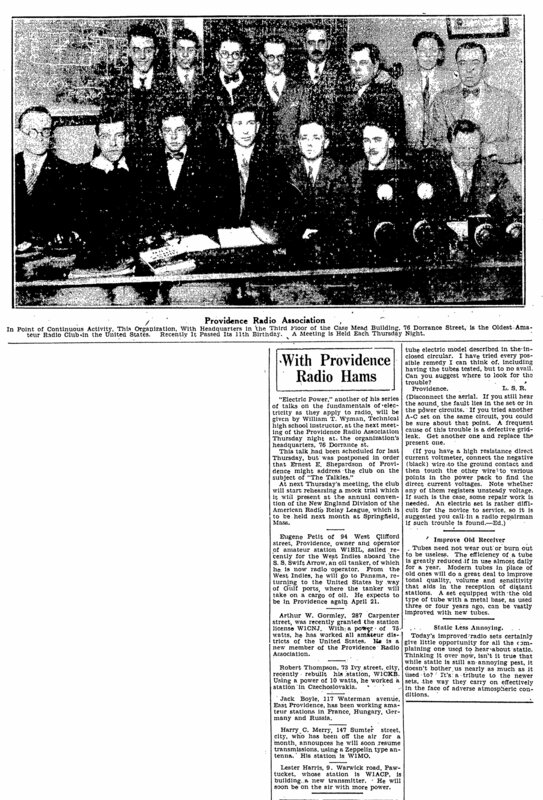 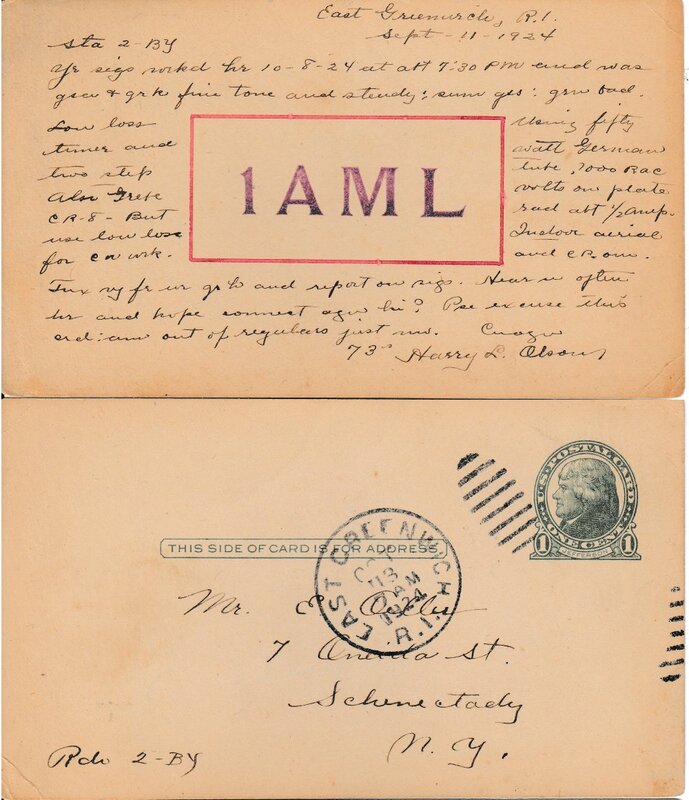 A clause was added to the Limited Commercial regulations, reading: "Licences of this class are required for all transmitting radio stations used for broadcasting news, concerts, lectures, and such matter. 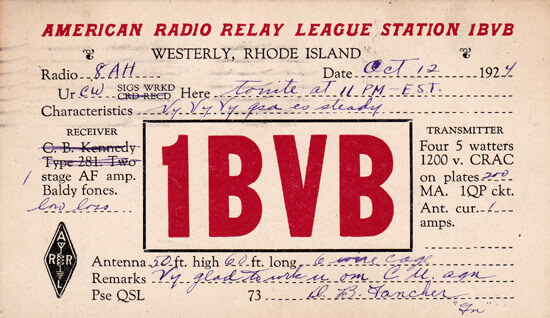 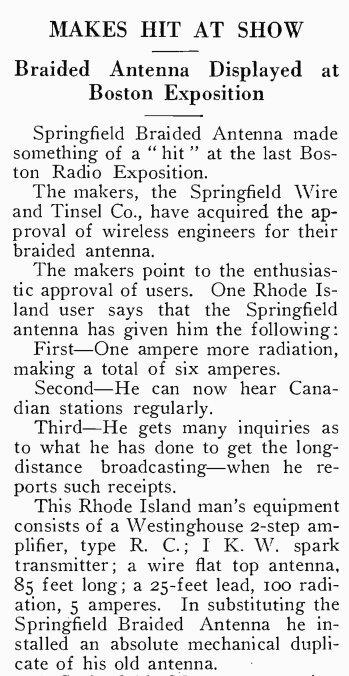 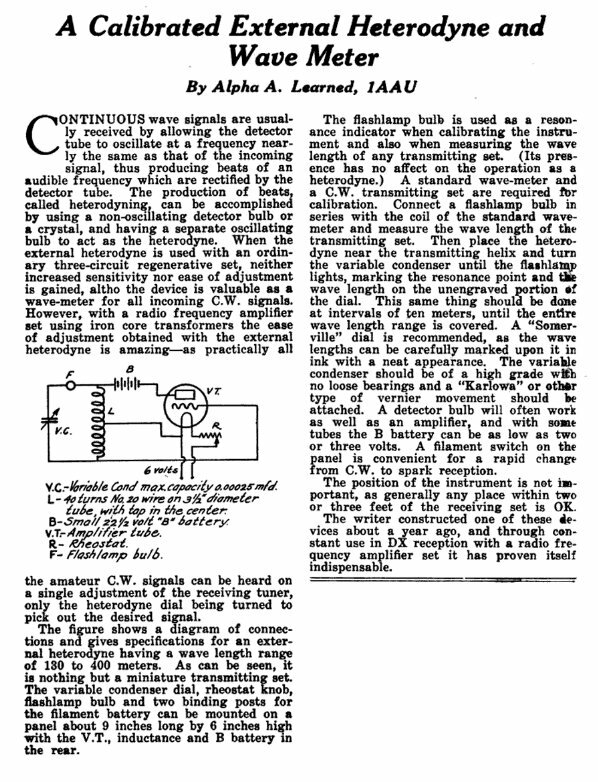 Thus, broadcasting was formally introduced using just two wavelengths -- 360 and 485 -- in the 200 to 600 meter band. 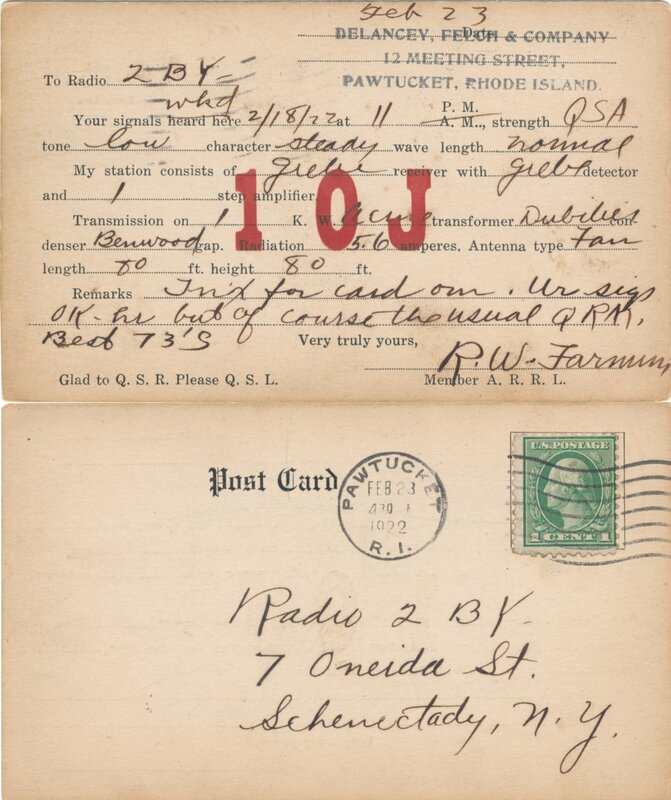 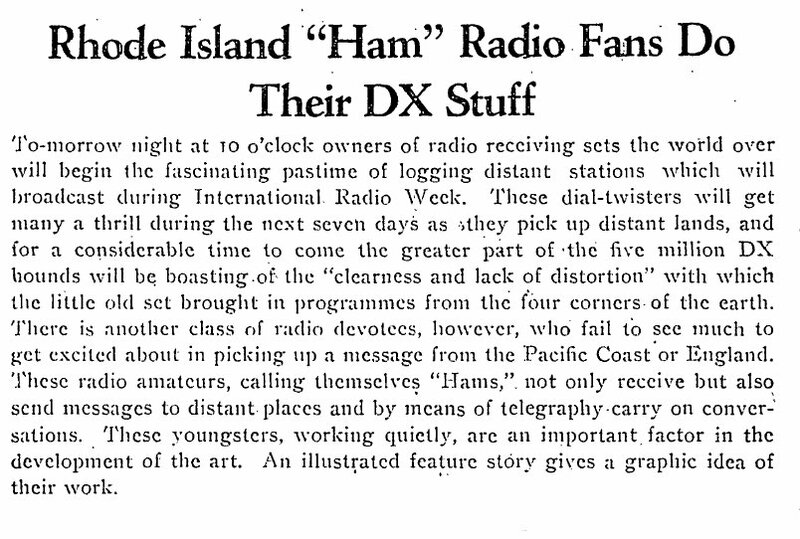 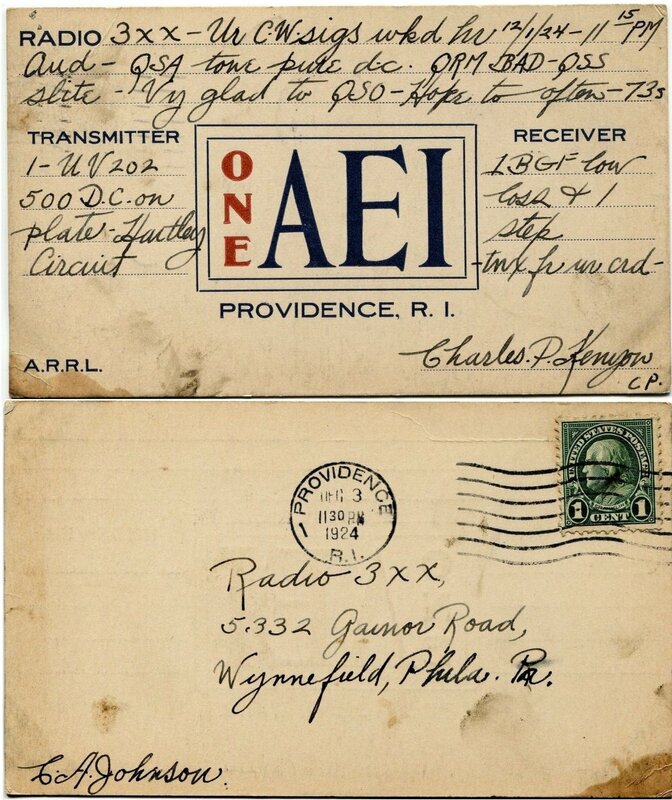 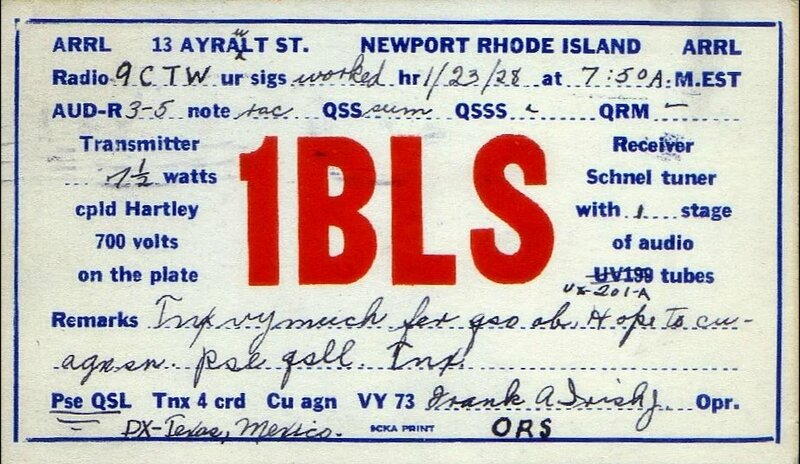 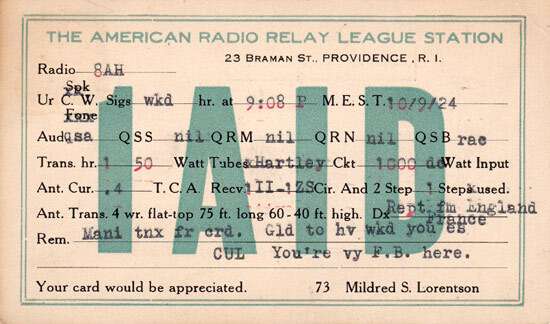 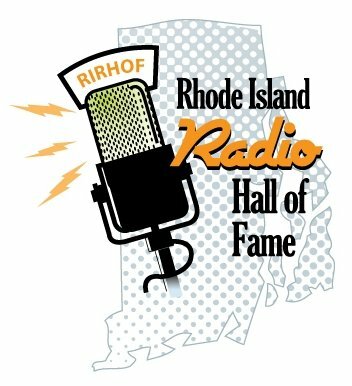 1XAD Pawtucket, RI Standard Radio & Elec. 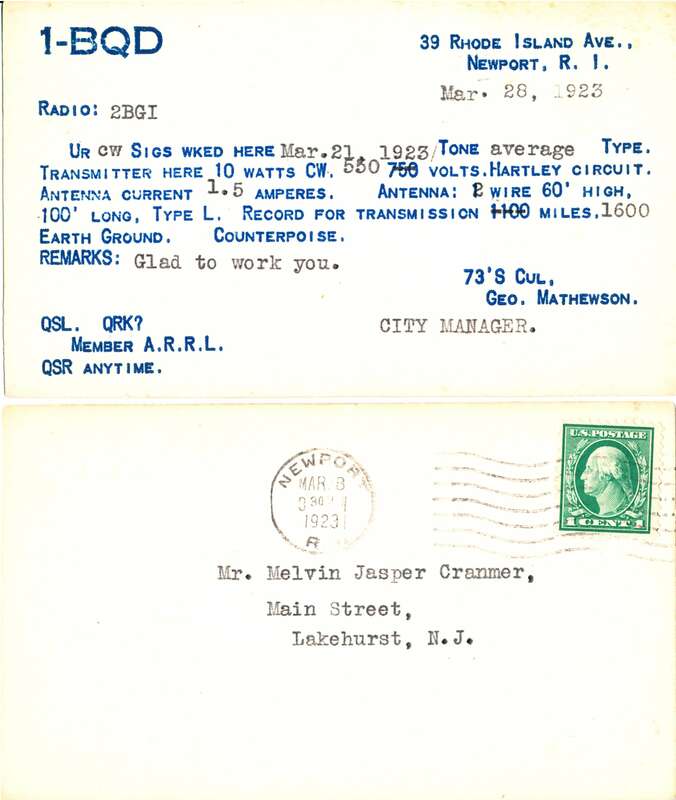 Company 290 Thomas P Giblin 2 50-watt tubes, radius 400 miles. 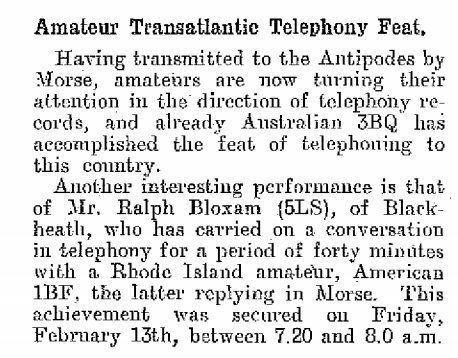 Heard at distances of 1,000 miles. 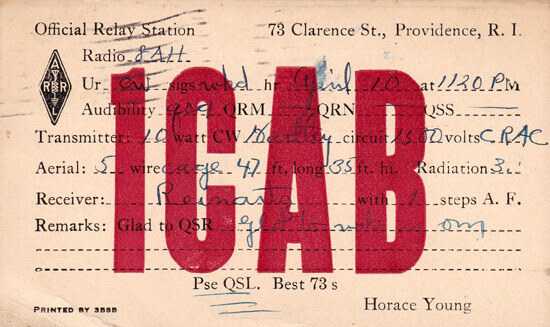 Located at 463 Broadway, same city. 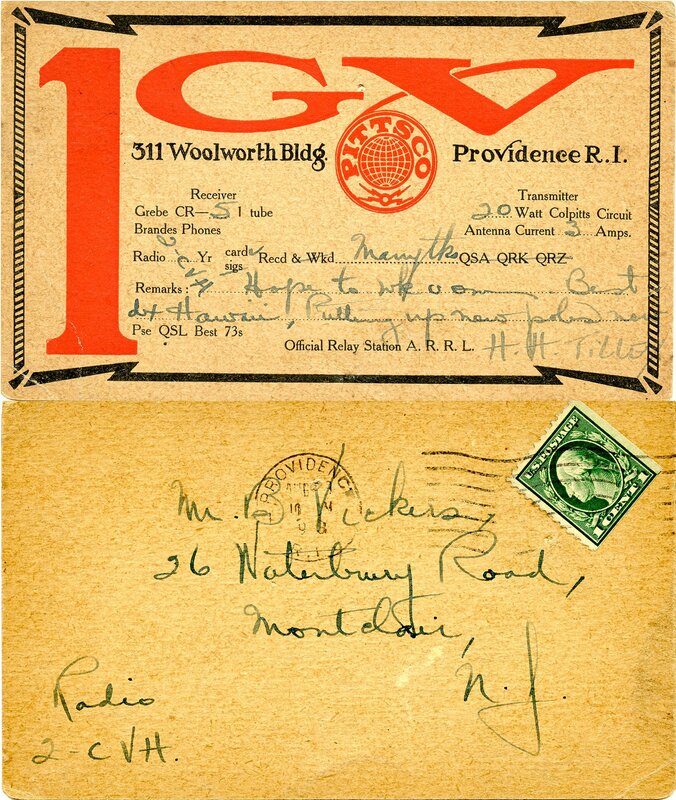 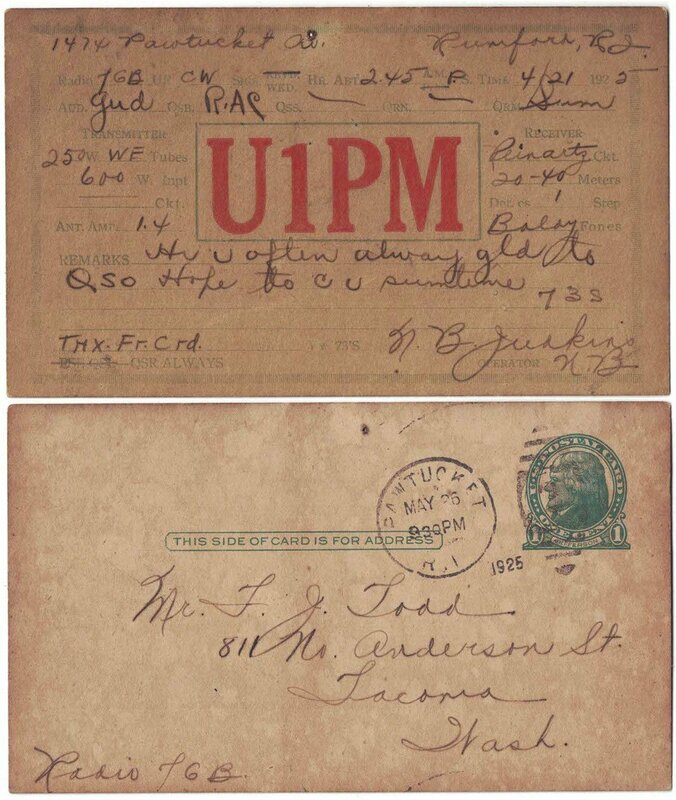 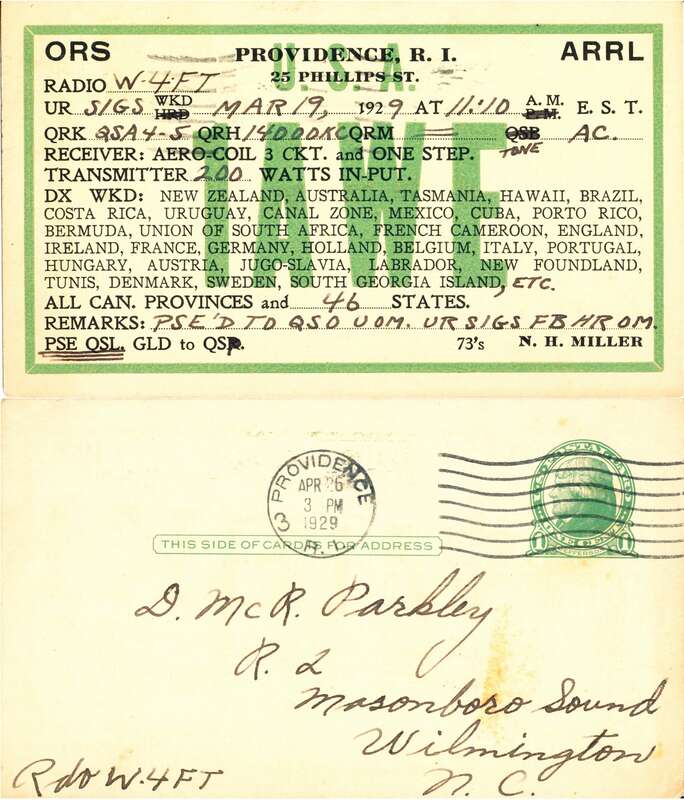 Broadcasts three days per week, music, lectures and letters read. 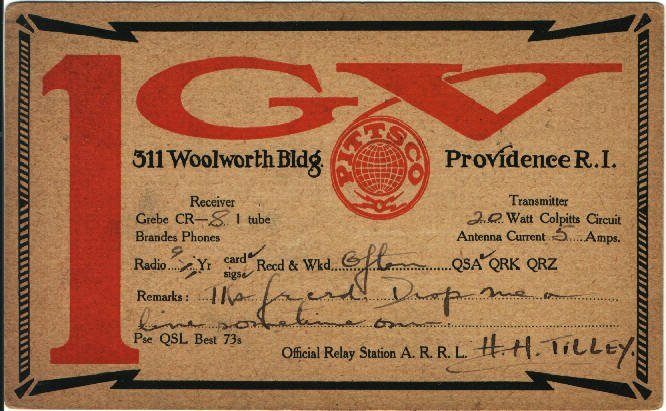 Now working on 290 meters. 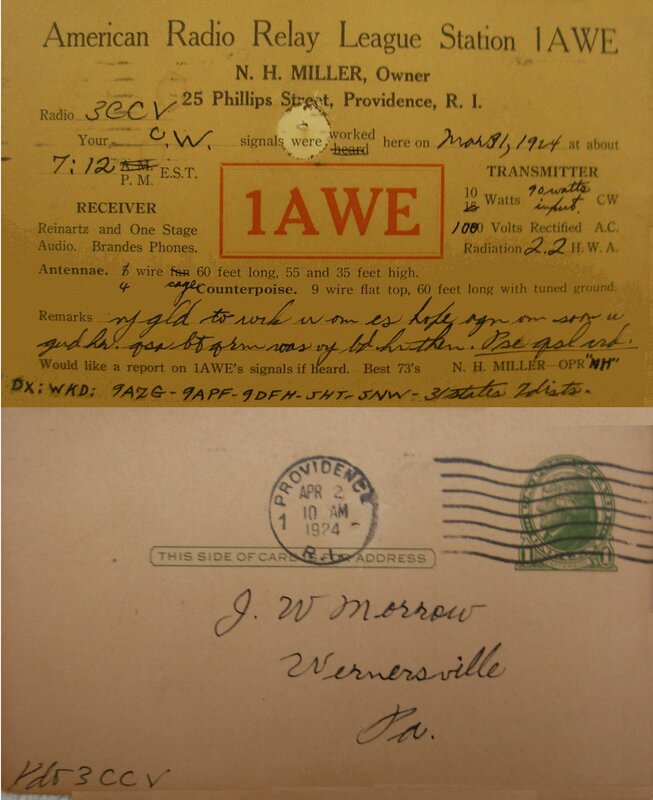 Aerial 70 foot long, 9 wires on spreader 15 feet, 11 wires on counterpoise. 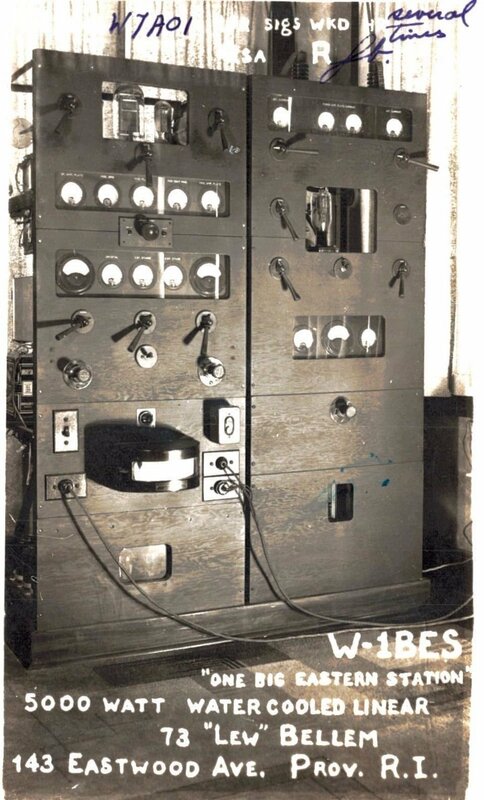 Ground, 11 wires 70 foot long, copper plates at end. 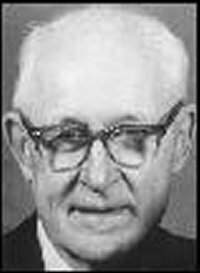 Merrill Peckham Budlong was Born in Arlington, New Jersey, May 21, 1912, and was a resident of Rhode Island from the age of two. 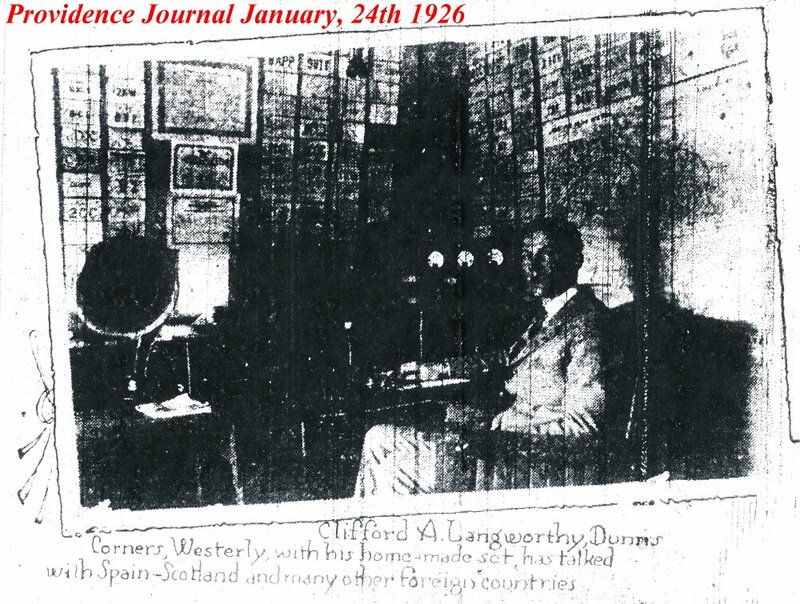 He resided the Edgewood section of Cranston since 1918. 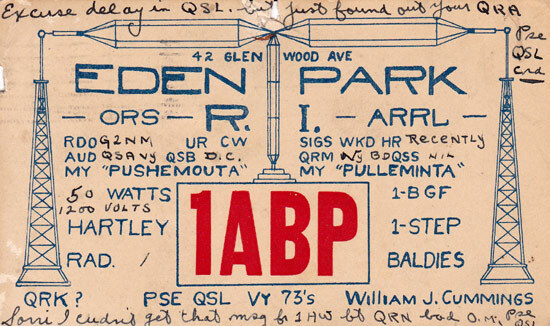 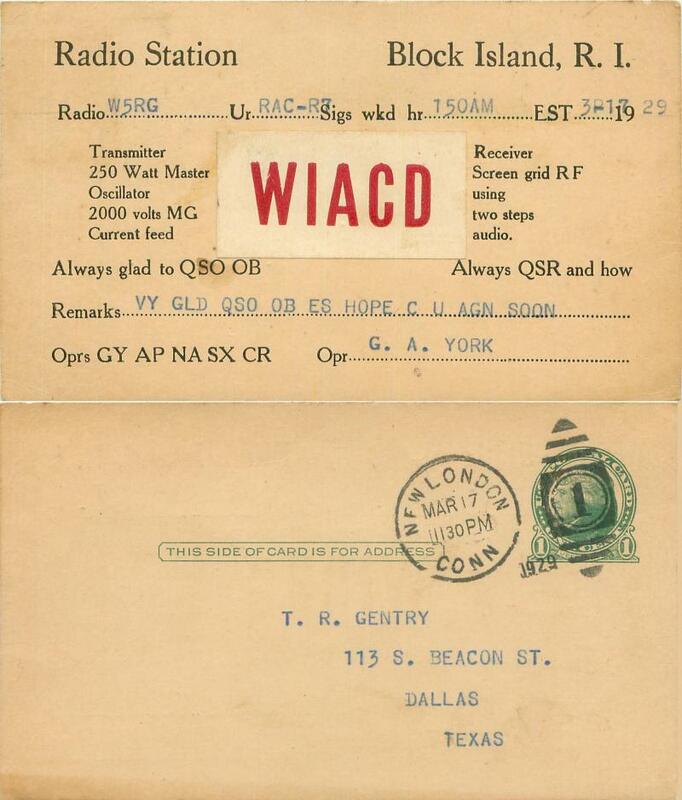 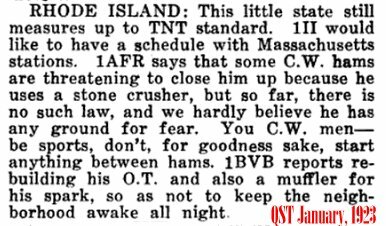 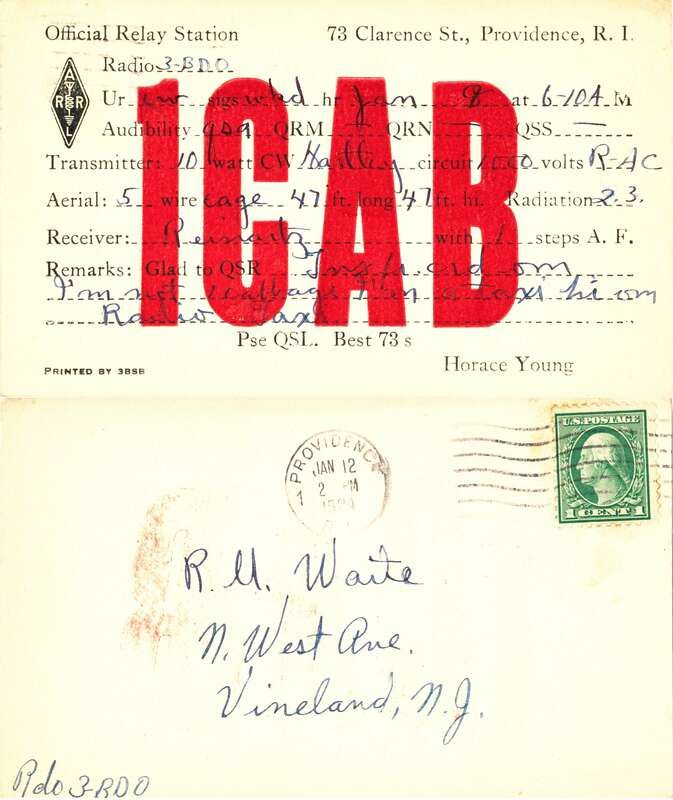 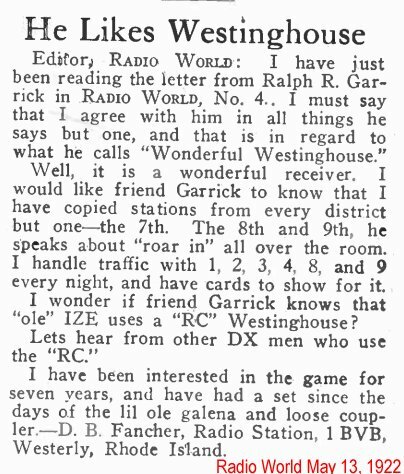 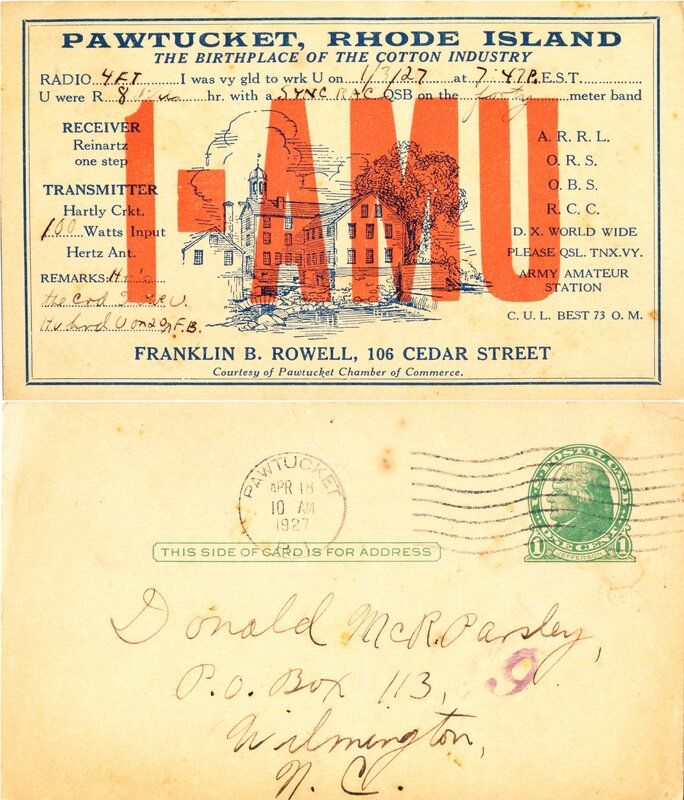 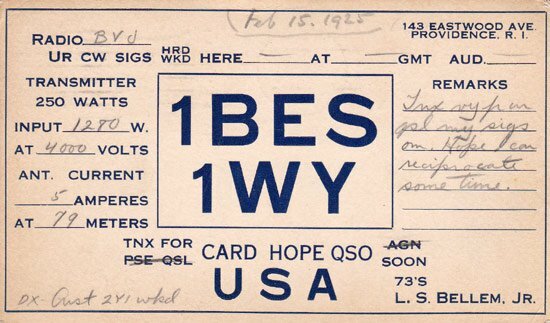 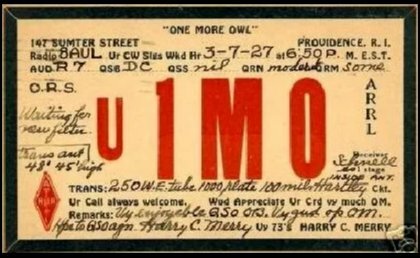 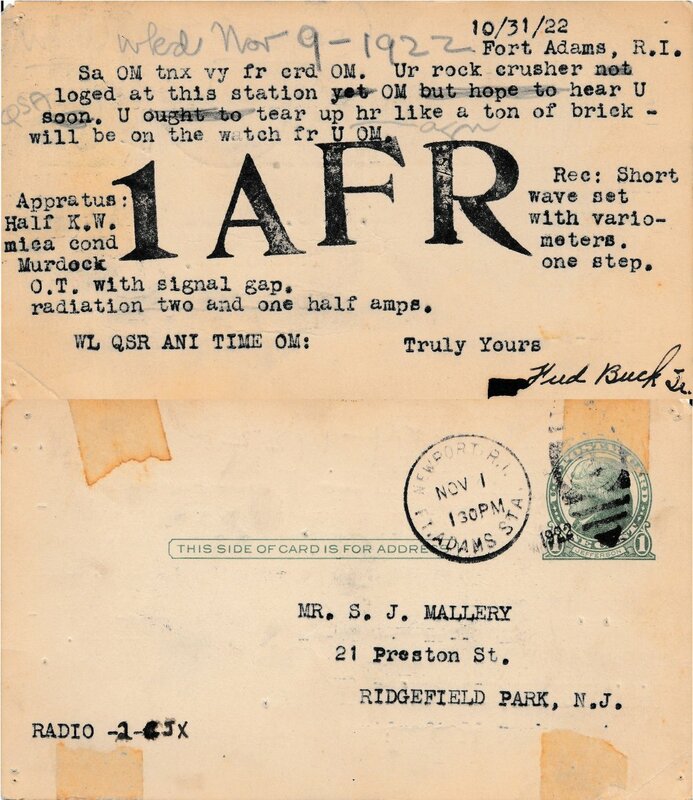 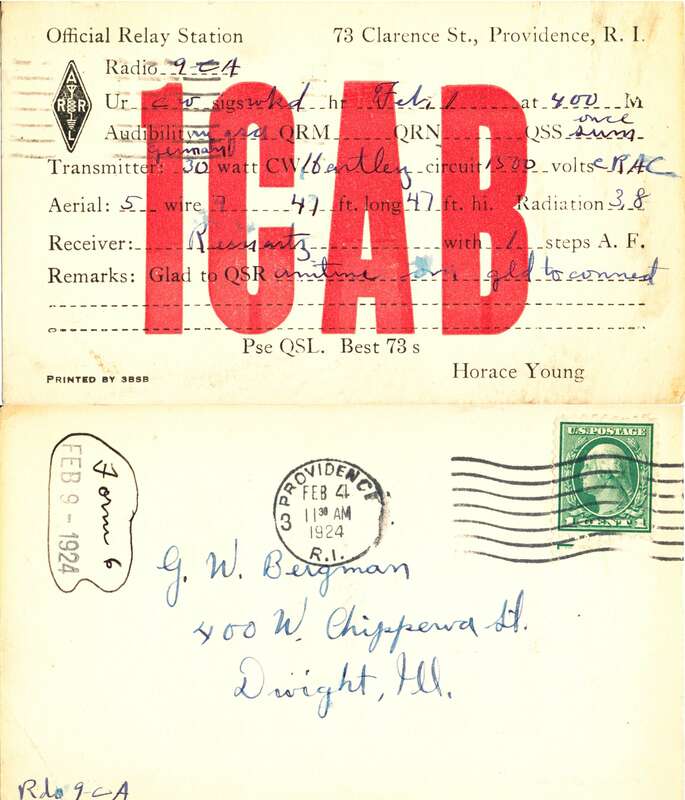 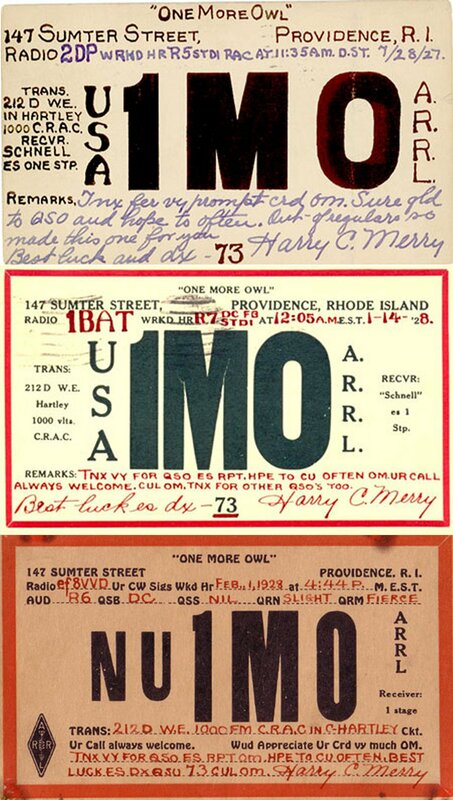 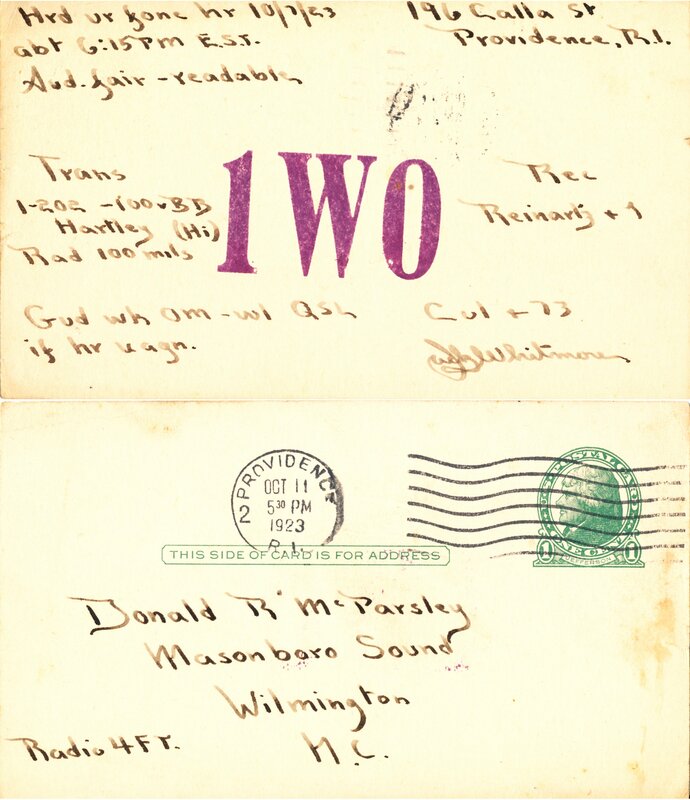 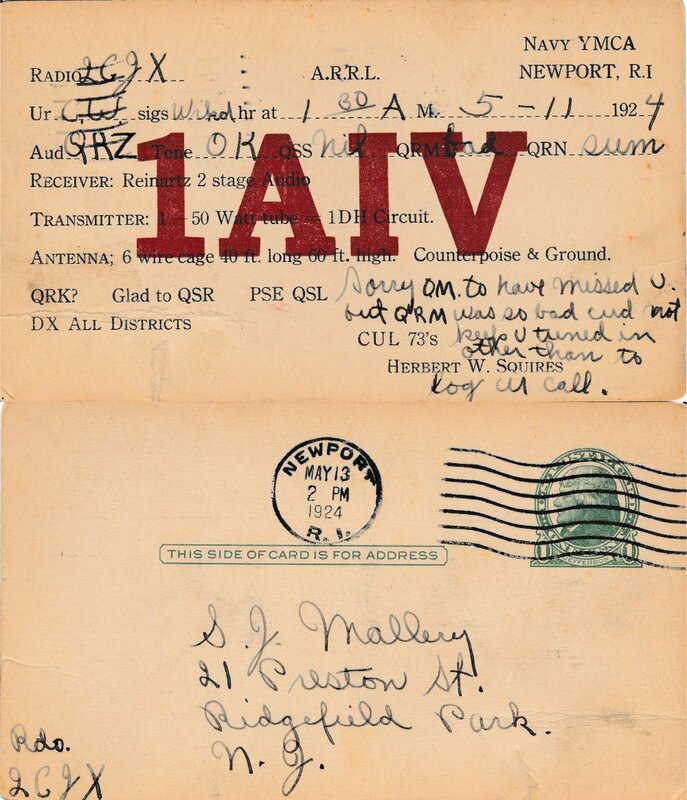 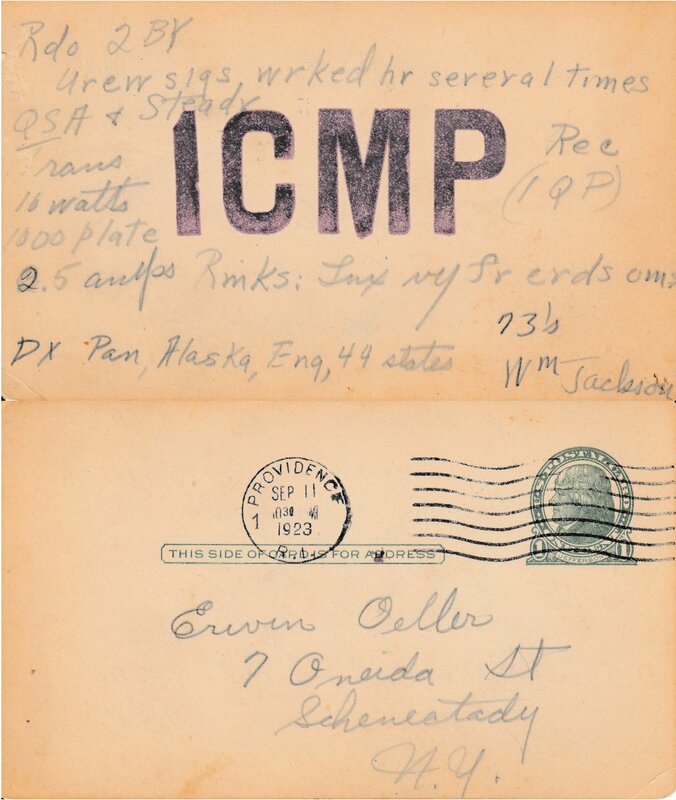 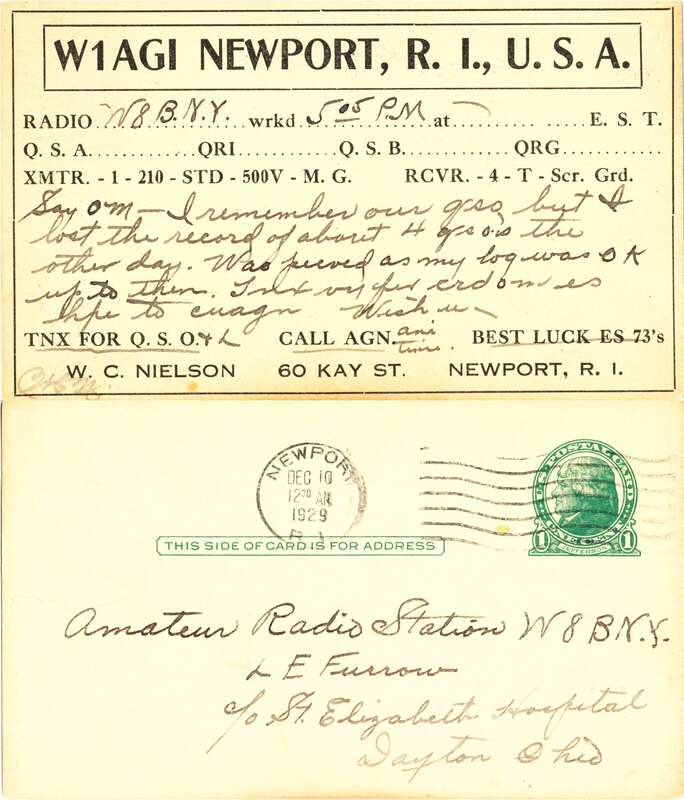 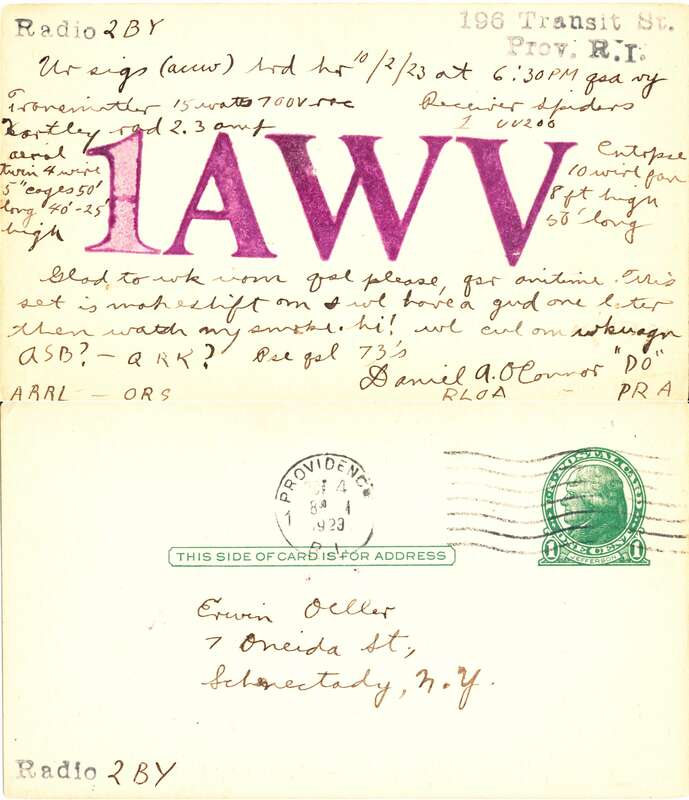 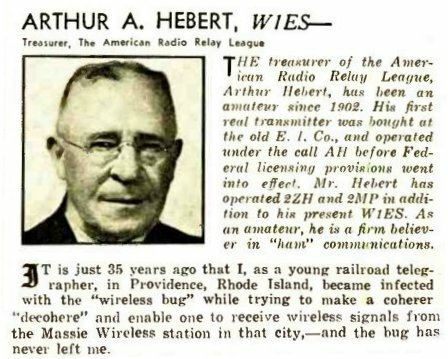 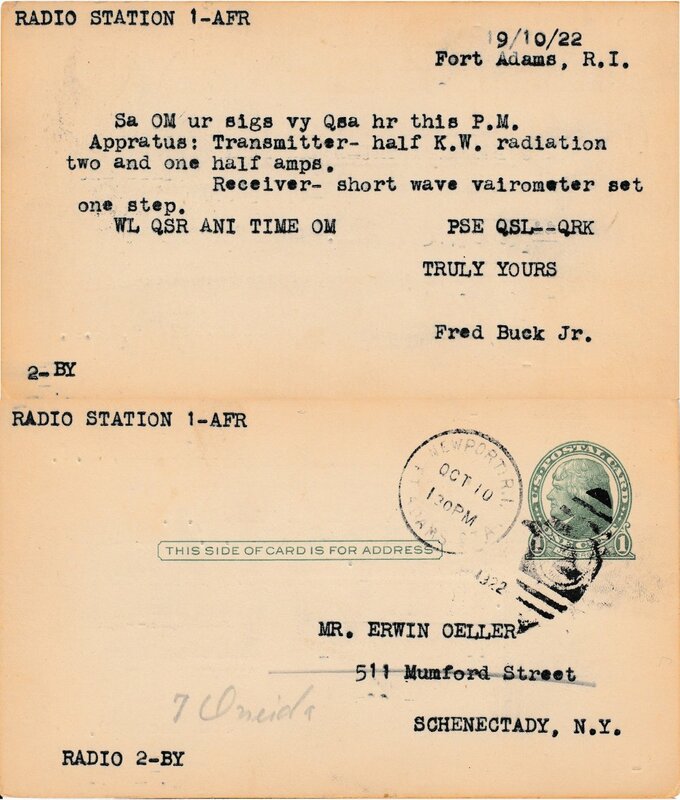 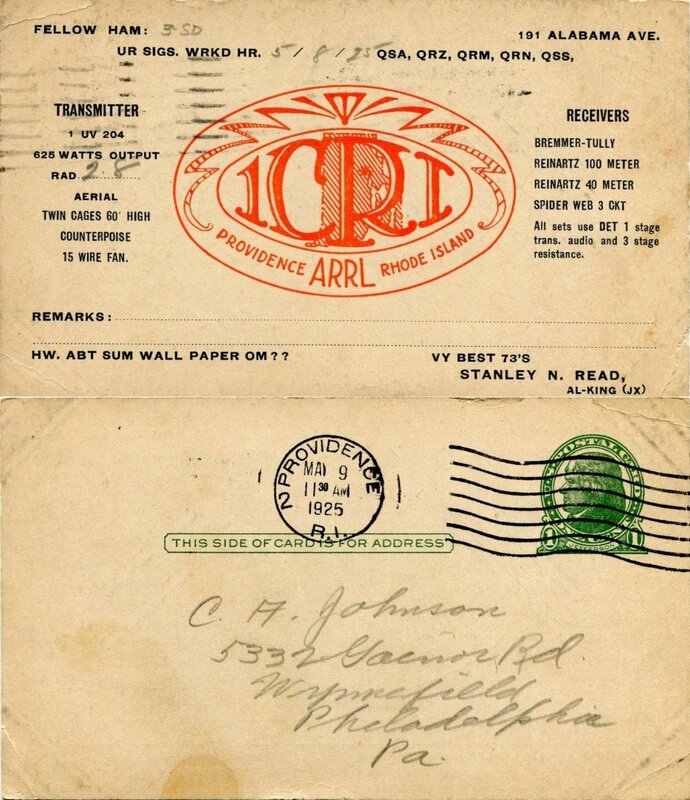 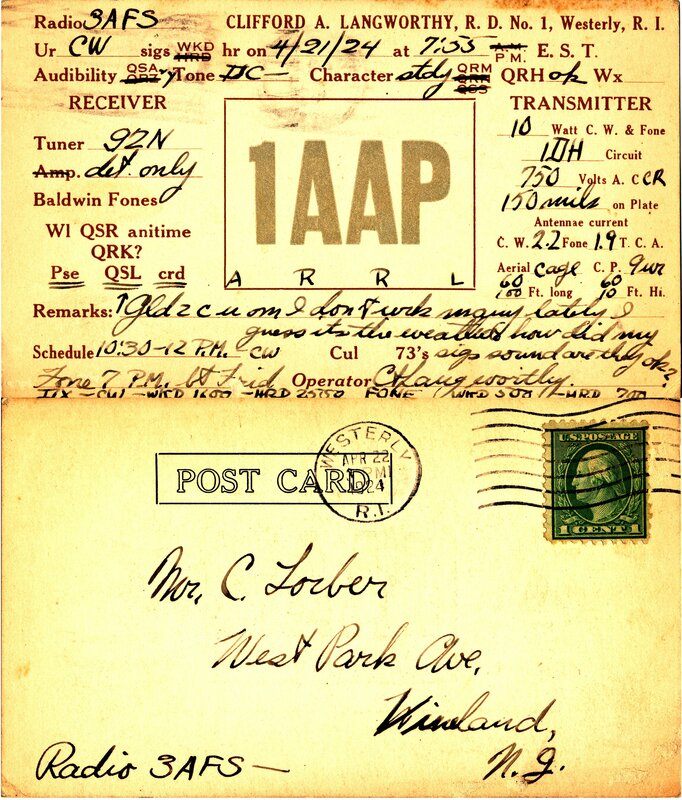 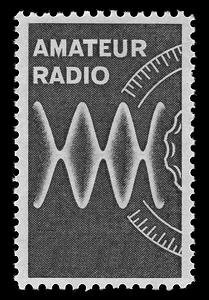 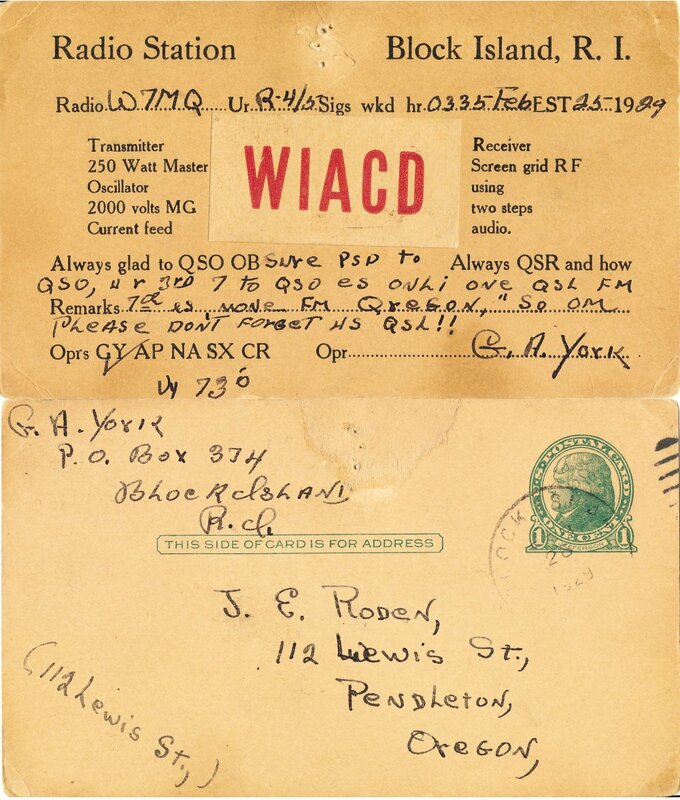 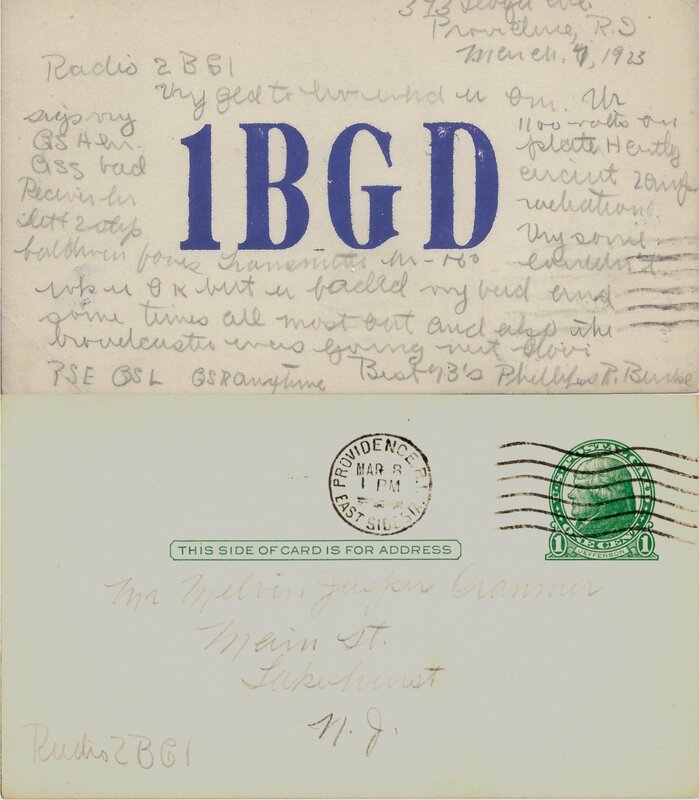 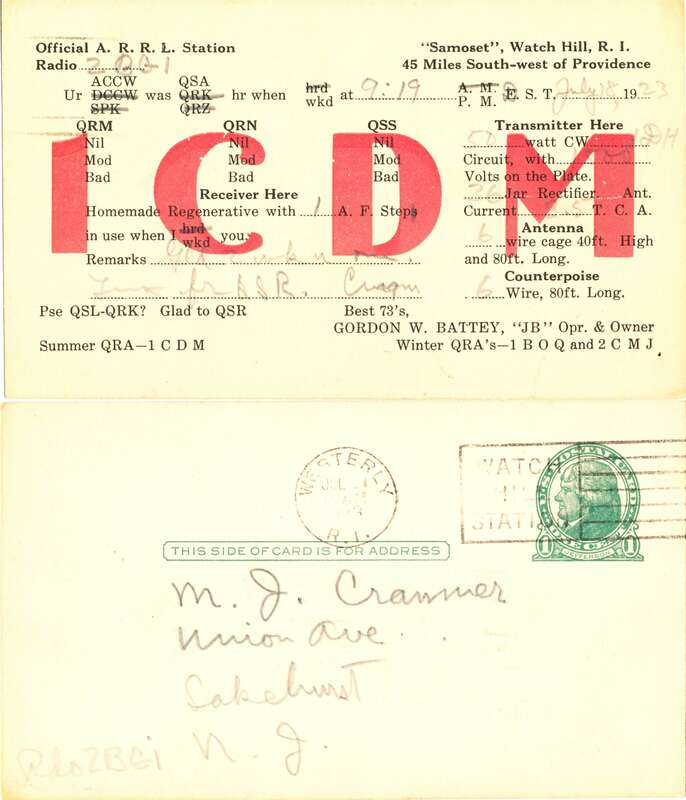 As an avid amateur radio operator (call letters W1MB) and proficient Morse Code operator, he enjoyed contacting radio hams throughout the world. 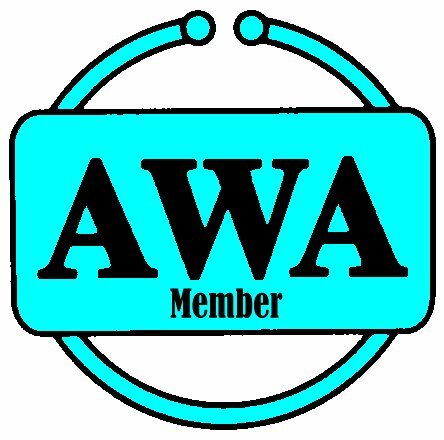 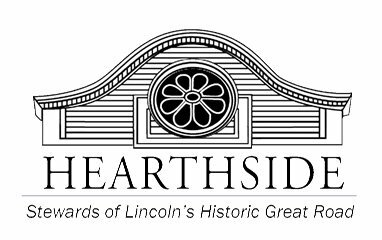 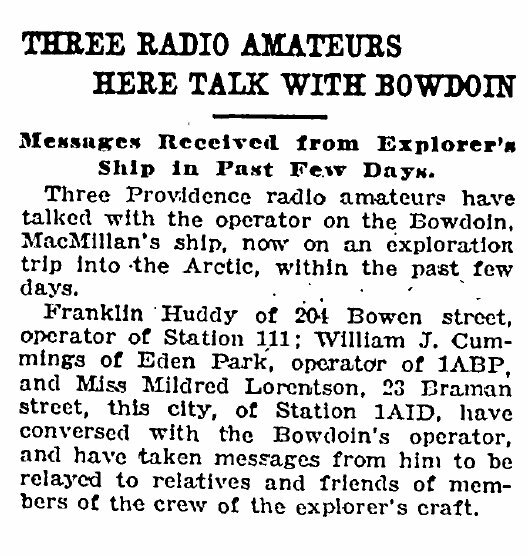 He founded the Fidelity Amateur Radio Club, which met for more than thirty years at his home. 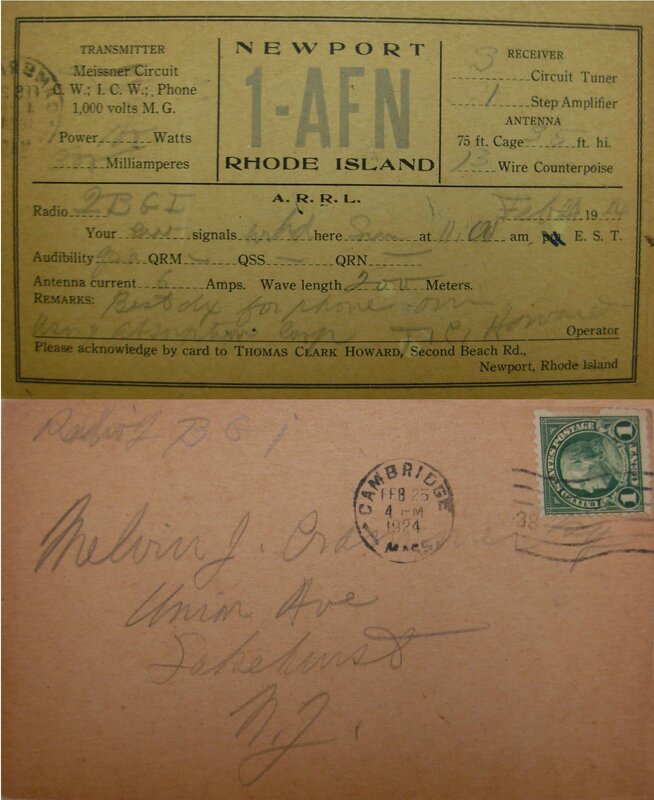 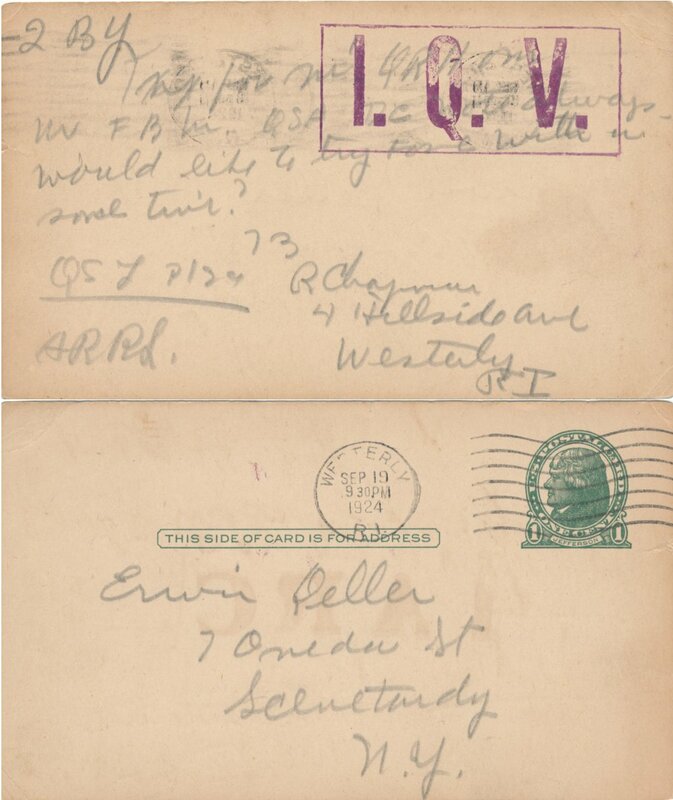 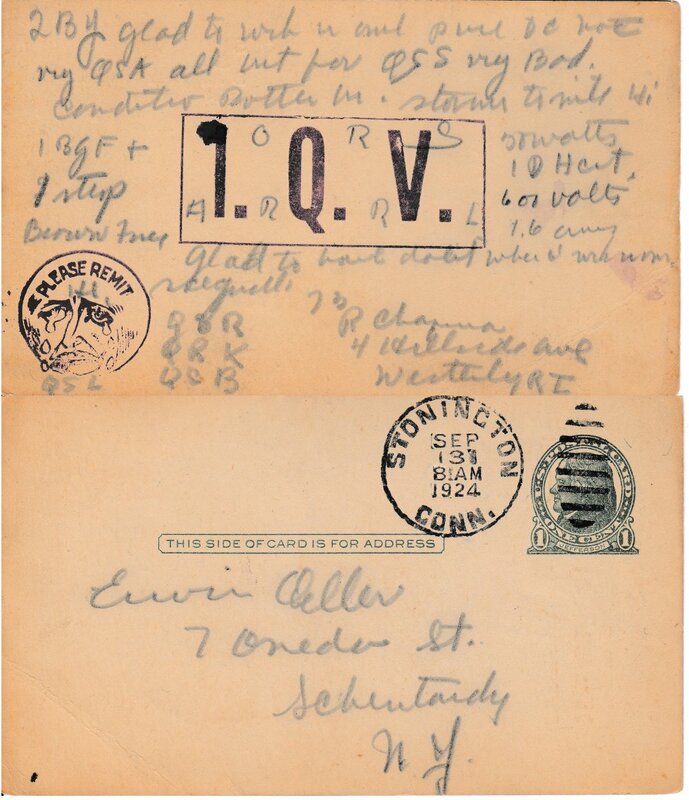 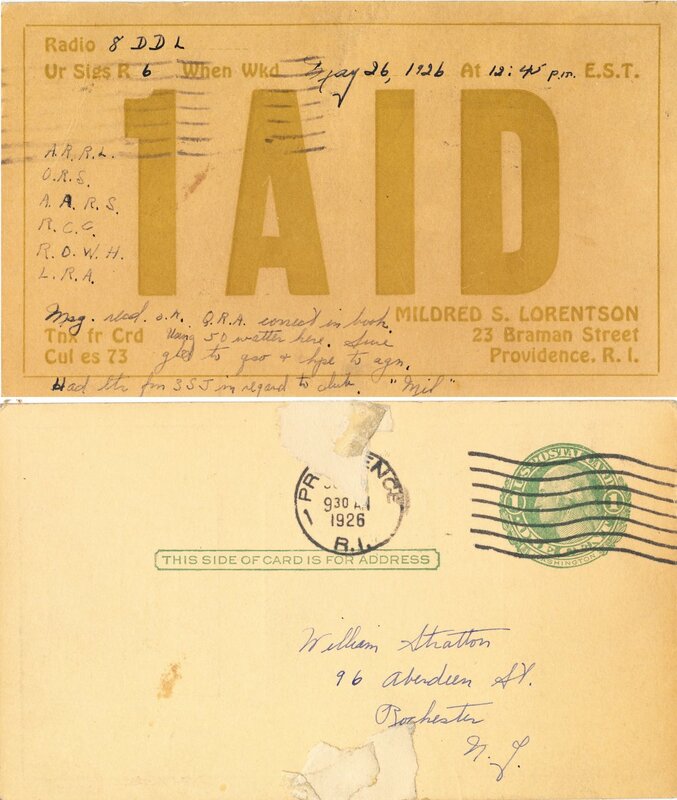 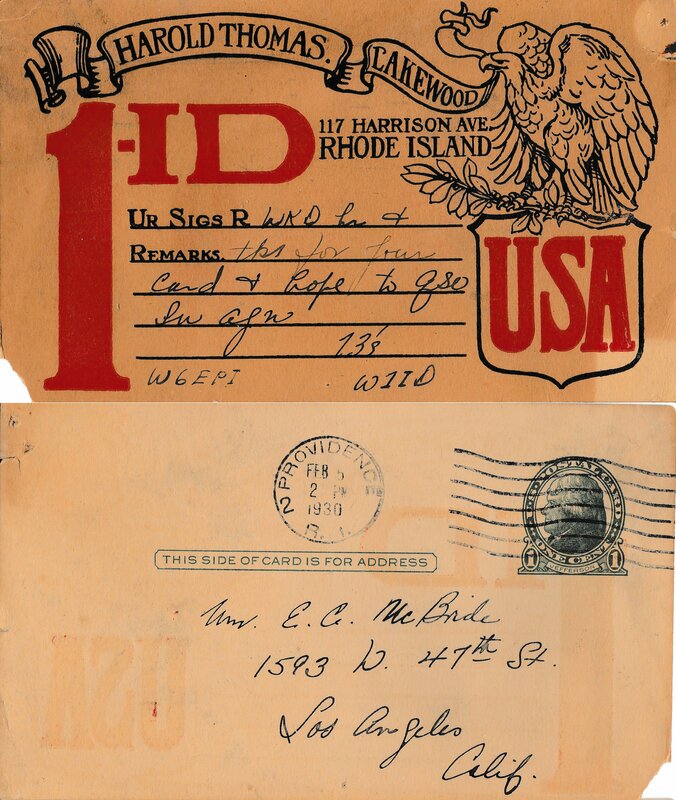 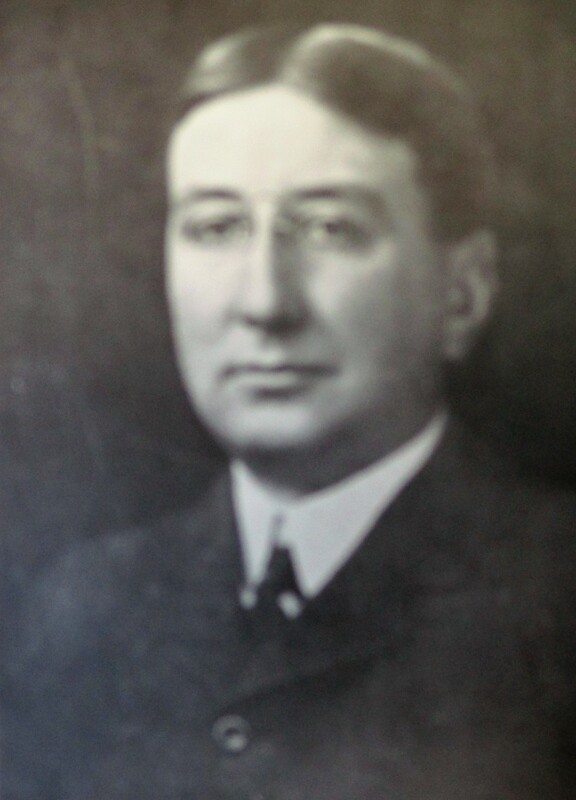 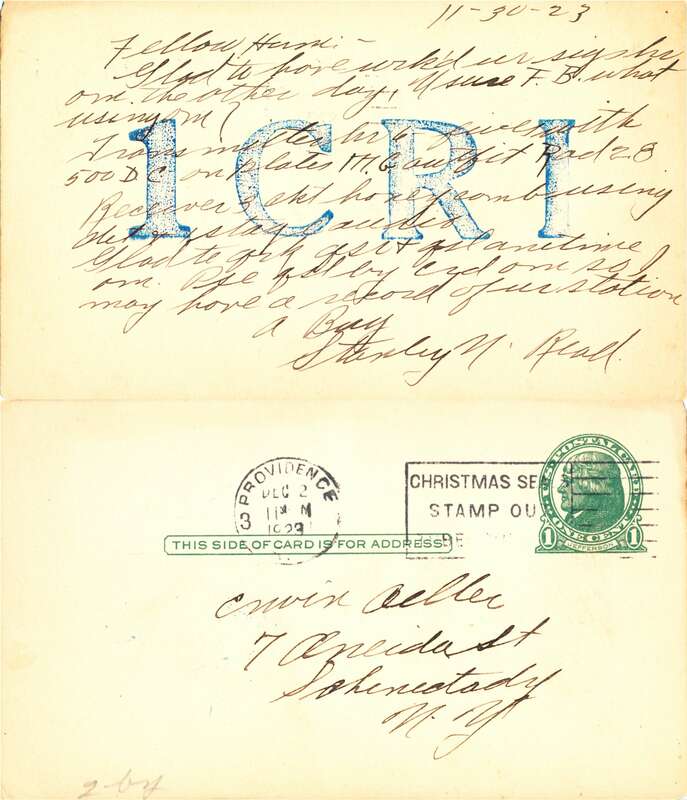 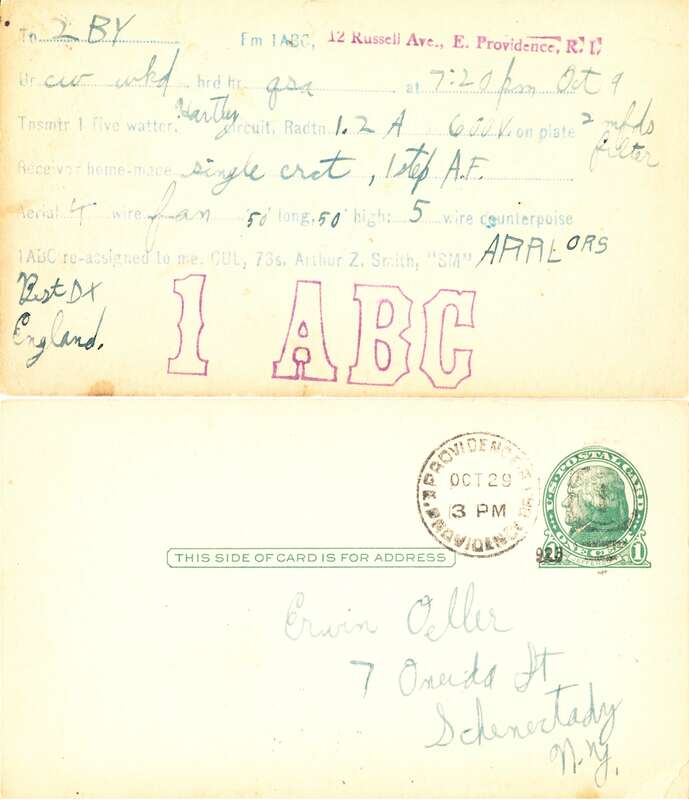 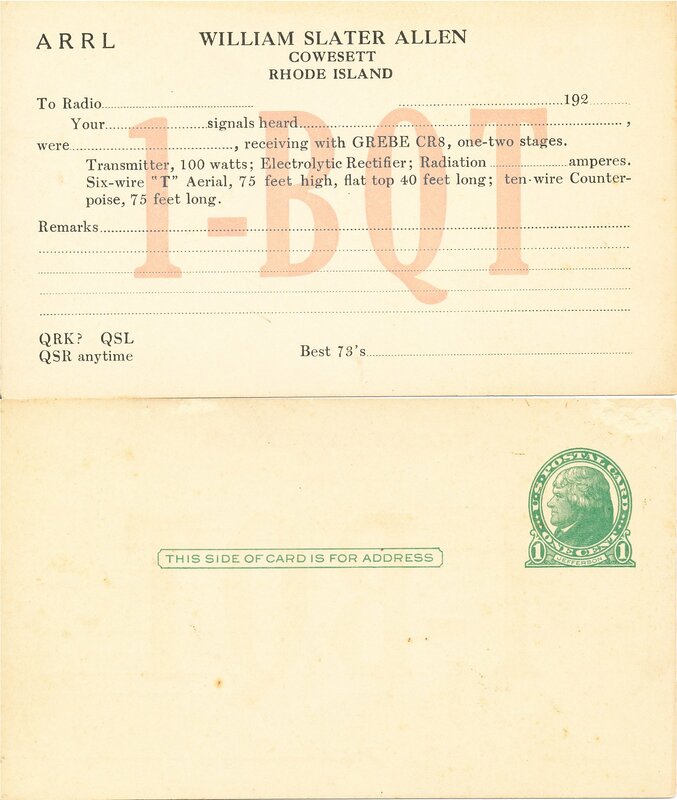 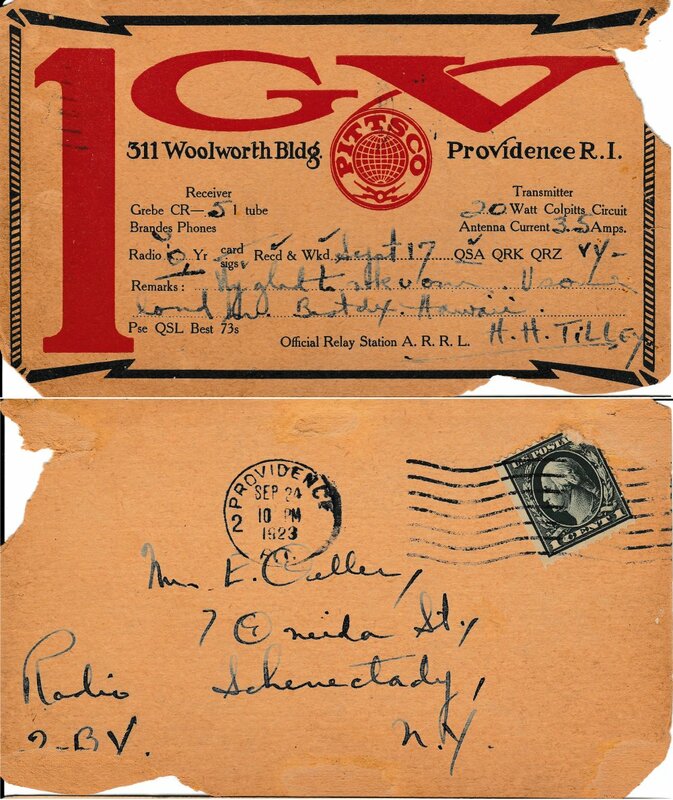 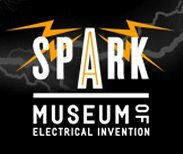 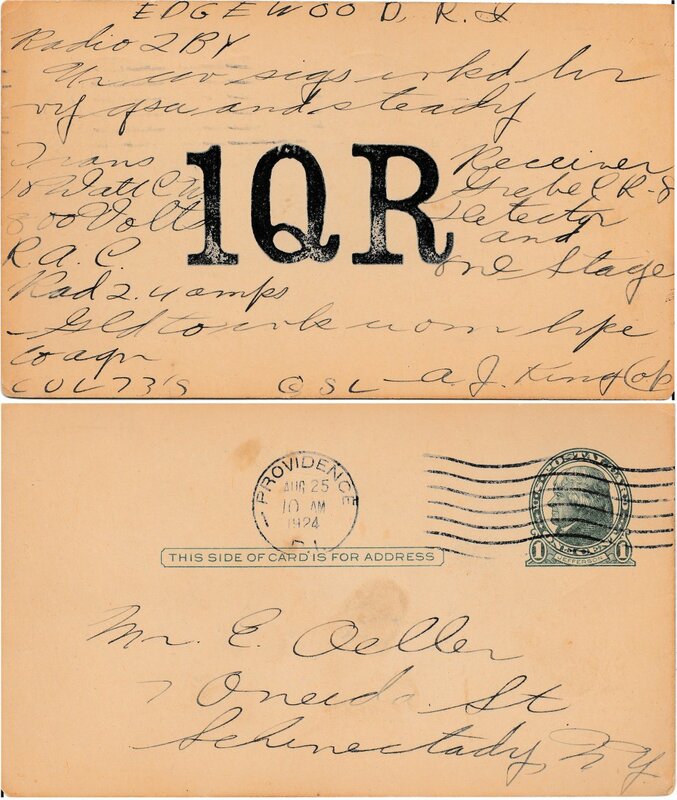 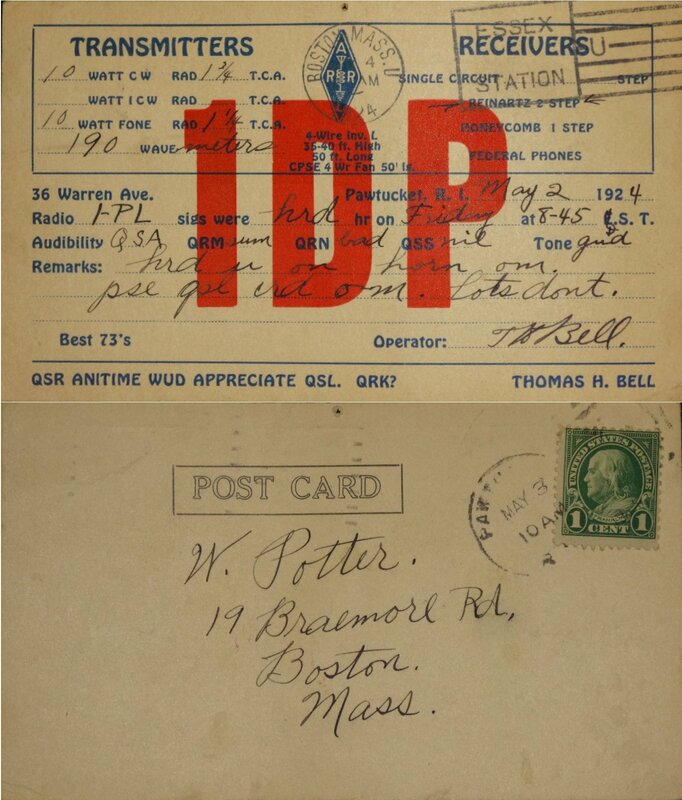 He was a Major in the R.I. Civil Air Patrol and a director of the New England Wireless and Steam Museum 30. 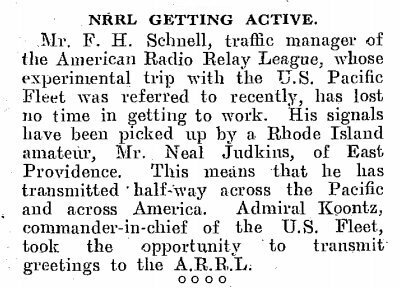 During the war Merrill was exempt from the military but got very active in the Civil Air Patrol, another quasi military group. 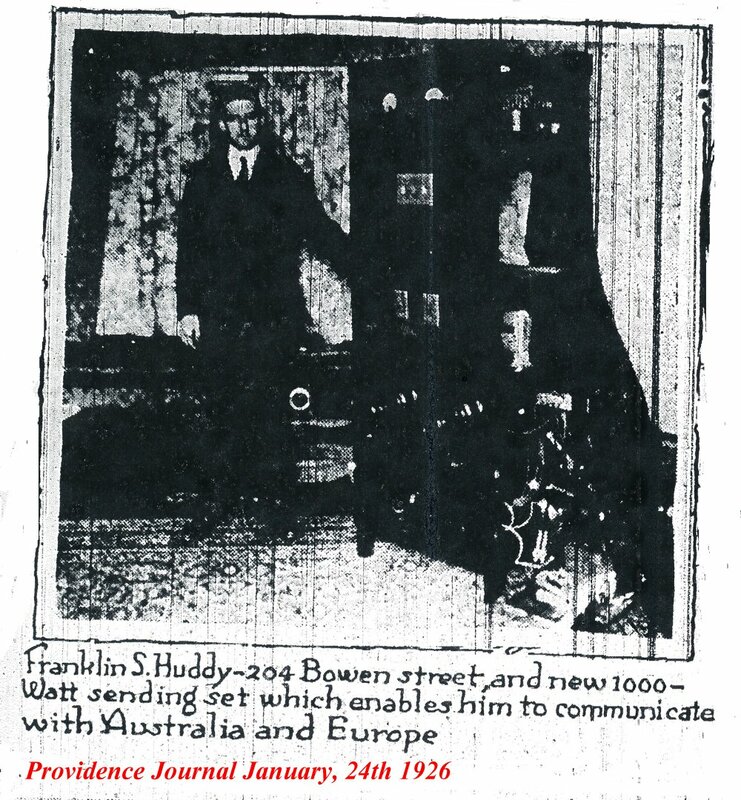 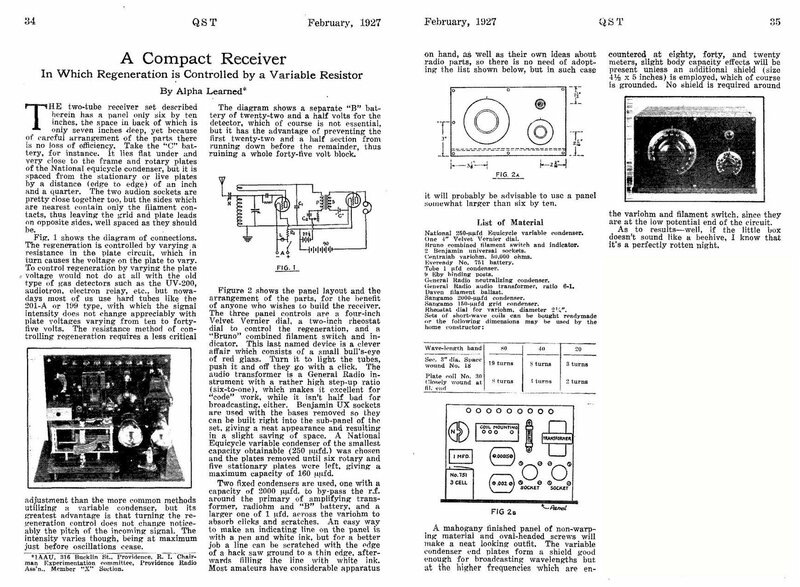 He designed this little radio called the "Little Rody". 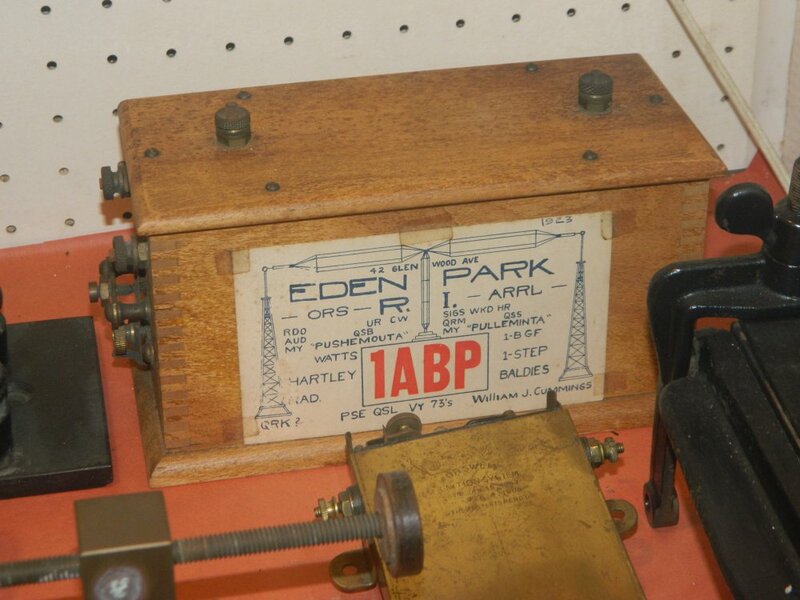 They made over one hundred of them and were used so that the different stations around the state could communicate in emergencies 31.